Dieser Artikel ist auch auf Deutsch verfügbar. Click here to find out more about Japan! Please note: This article covers an area which has been hit by one the most powerful earthquakes in history, a disastrous Tsunami, several nuclear meltdowns and the release of nuclear material into the atmosphere, the sea and the soil. Thousands of people have died, tens of thousands have lost their homes, many will not be able to return for decades. If you plan to visit the Fukushima Evacuation Zone, please do so with respect, proper safety precautions, and guided by an expert. Careless exposure to radiation and radioactive materials is a serious health risk. Should you recognize your property in any of the pictures and want it to be removed, please contact me. I was the only foreigner on the train, as so many times before. It hadn’t been that hard – there were only five people left at all, and I guess this train line didn’t carry that many foreigners to begin with. I checked my luggage for completeness a last time and looked out of the window. It was dark, cold and rainy, as you would expect at 9 PM in mid-October, but it also set a gloomy mood for this trip. The announcer mentioned my last stop, and I got off. 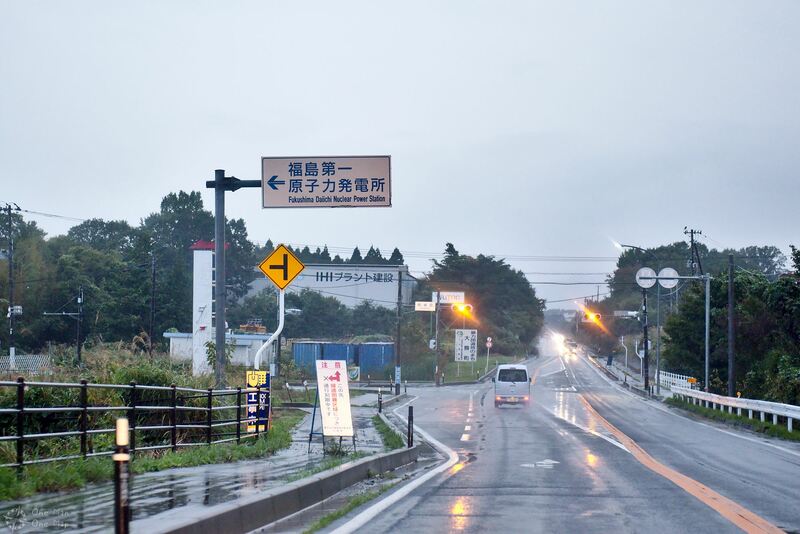 Haranomachi (原ノ町), four stops on the northern Jōban Line (常磐線) before the current border to the Fukushima Evacuation Zone. Back in 2016 I had come across a news item which mentioned that parts of the Fukushima Nuclear Disaster Evacuation Zone, which covered a 20 kilometer radius around the damaged Fukushima Daiichi Nuclear Power Station (福島第一原子力発電所), had been lifted, and that a small number of guides was offering tours for interested people. 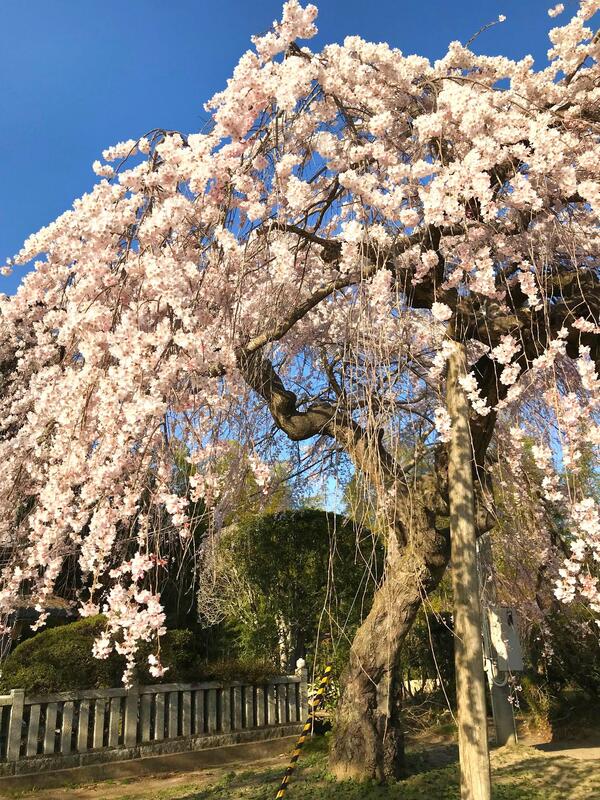 When I decided that my small around-the-world trip would also go across Japan, I considered taking part in one of these tours, but was reluctant at first. Would it be safe? Did the people in the area actually want me to go there? 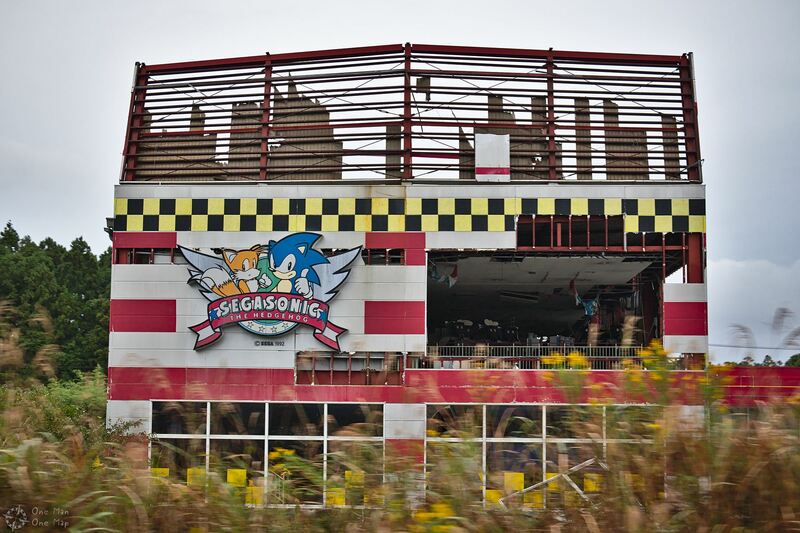 Why do I even wanted to go there, to a disaster zone where thousands of people had died and the survivors will most likely continue to struggle for decades to come? It was most certainly not a place for tourists on the search for the next thrill. After a couple of weeks I came to the conclusion that I would only go the area if people really wanted me to be there and if I could actually offer them something in return. The Fukushima disaster had quickly vanished from the news channels in Europe, even though a huge amount of people in Europe lives in the vicinity of nuclear power plants, and some of those are located in geologically active regions like the Rhine valley between Germany and France. What happened in Fukushima could easily happen in Europe, but hardly anybody really seemed to care. I hoped I would be able to capture the story of those who had to evacuate from one minute to the next and have returned six years later to rebuild their former homes and neighborhoods, as a warning for my fellow citizens back home. I looked up two of the NGOs which offered guided tours, ran their web sites through Google Translate, and sent them short, carefully worded e-mails in simple English explaining what I had in mind. Two weeks later I got an answer from Karin Taira. The NOMADO project, whose members have already guided thousands of Japanese visitors through the area, had forwarded her my e-mail because they didn’t have anyone who was comfortable with replying in English. Karin has a masters degree in International Politics, speaks excellent English and was eager to welcome me to the Evacuation Zone and show me around. 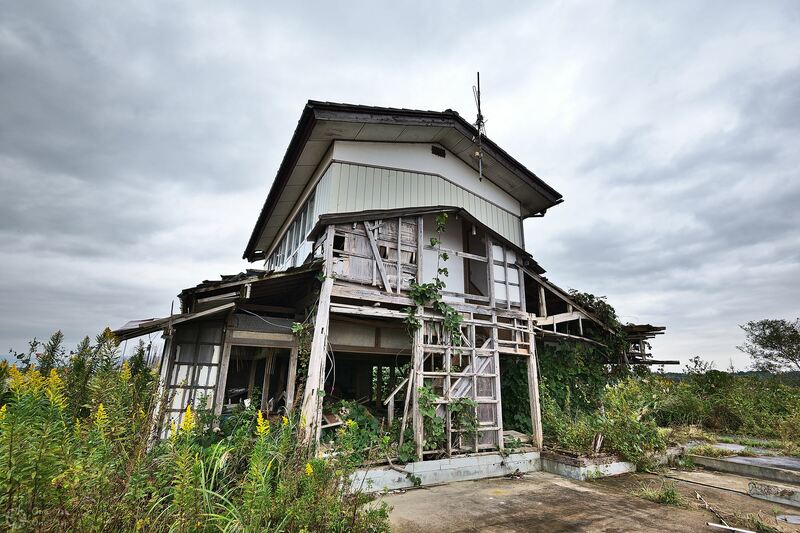 She had recently opened the Lantern House, a Bed & Breakfast guest house, right in Odaka (小高町), just 15 kilometers from the nuclear power station. 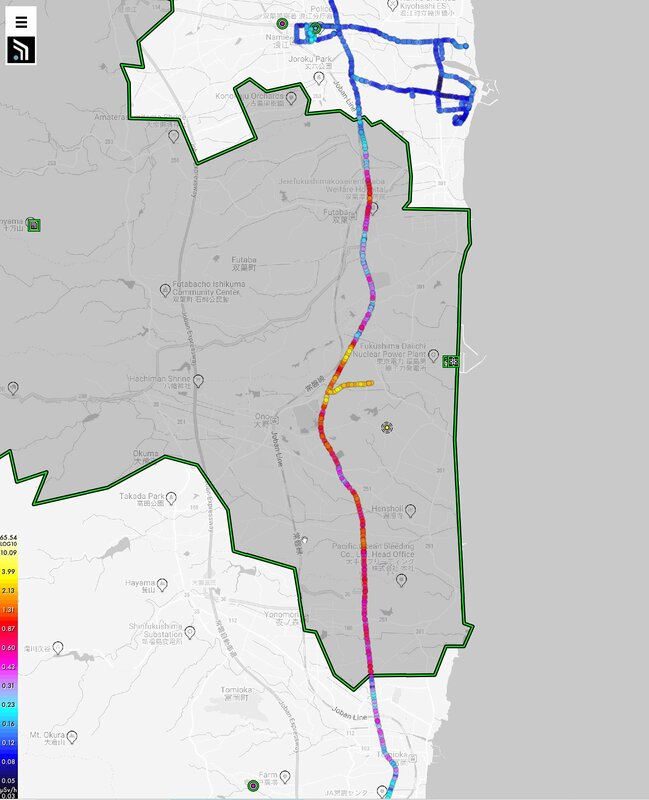 Over the course of the following weeks we carefully planned my visit to the Evacuation Zone. I had never expected to run into someone as dedicated and knowledgeable as Karin. She knows all the data, all the places and all the people. When I came up with the idea to maybe do some short interviews with former evacuees, she arranged a meeting with Katsumi Anbe, a city government official who was the head of the Odaka ward education office before the disaster. On October 15, 2017 I stepped off the train and was picked up by Karin, who drove me to the Lantern House. I fell asleep in a big, beautiful Tatami room and was greeted by a home-made breakfast early in the next morning. Karin wanted me to get a good overview before we were to meet Anbe-san later, so we did a quick tour down to the shore, through Namie Town (浪江町) and back. The sky was cloudy and bathed the scenery in a gloomy light, making everything look even more sad and surreal than it already was. We took a bGeigie nano device with us, a portable GPS-enabled Geiger counter created by the SAFECAST community, which was linked to Karin’s iPhone via Bluetooth. It would record our route and the radiation levels at all times, both for our safety and so Karin could share the data with the community later. Every time we passed an official radiation monitoring station we compared the readings to prevent any mistakes. The shore had not just been hit by the earthquake, but also the Tsunami. 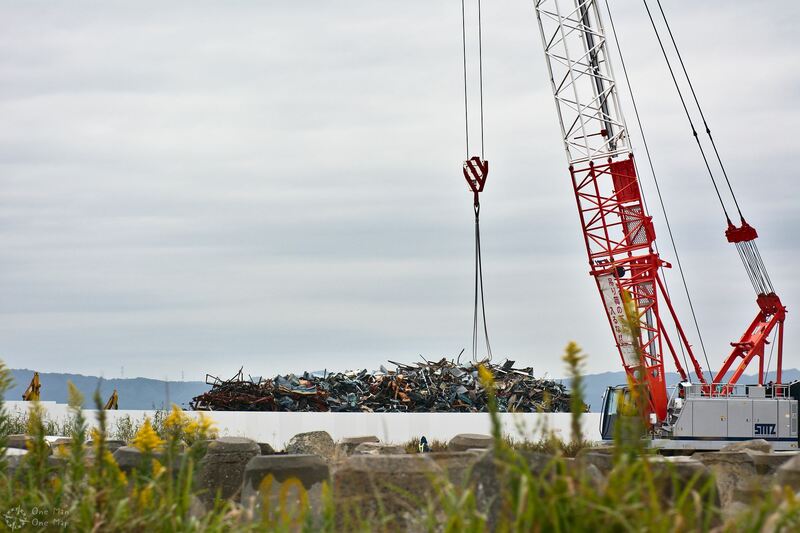 In contrast to the shores of Miyjagi (宮城県) and Ibaraki (茨城県), the adjacent prefectures, cleaning up the debris had been impossible until April 2016 due to the high radiation levels. So I got an unique opportunity to capture many buildings and objects which were to be torn down and removed over the following months. 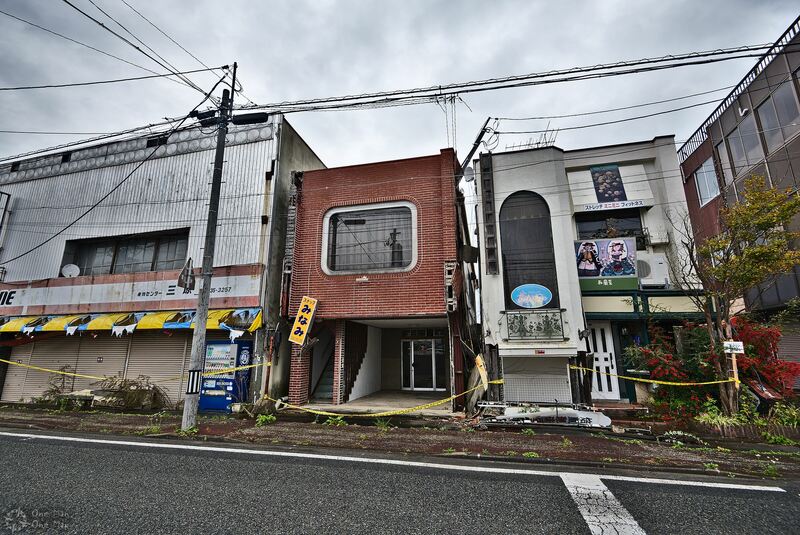 Most buildings close to the shore had been destroyed by waves up to six meters in height, and the Tsunami had taken a lot of debris with it when it pulled back out onto the sea. Incredibly some concrete buildings had managed to cope with the waves and were still standing six years later. 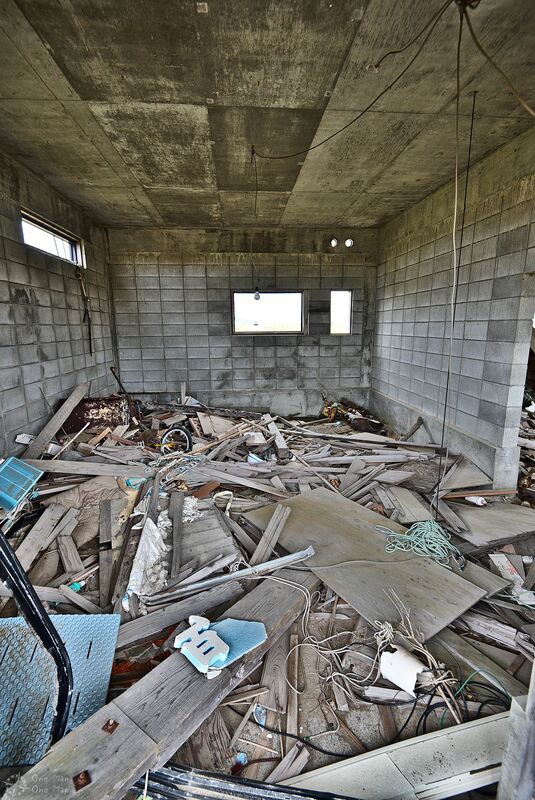 I was surprised to learn that the Tsunami itself had not been as devastating as I had imagined. The water didn’t go too far into the mainland in this area because it had quickly been blocked by an elevated road. So far more buildings had been damaged by the earthquake alone, which is why many were still standing and we could still see many personal items in the ruins. We didn’t enter into the buildings, on one hand due to the structural damage, but more importantly out of respect for the victims and homeowners. This was not a completely abandoned area. 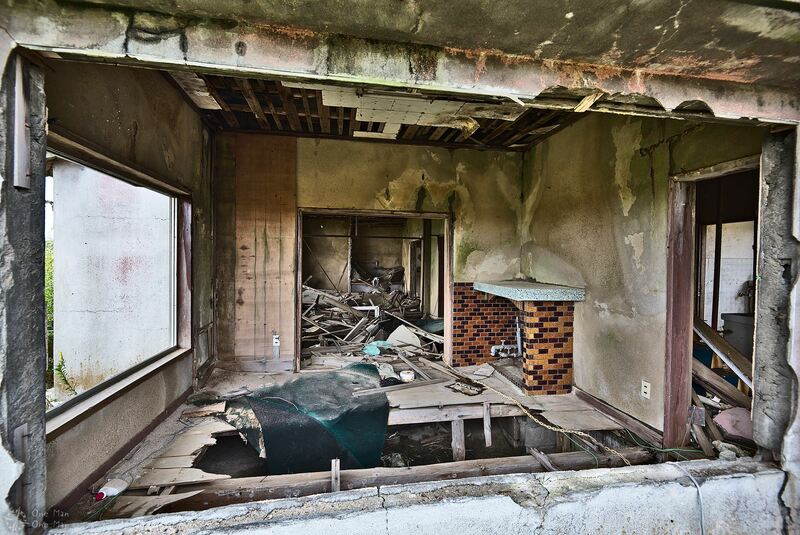 People might come back to visit their private property or even try to rebuild it, and I wouldn’t want them to have to find the traces of some foreign intruder walking around in their former living room. There have been some problems with intruders looting the ruins (especially for scrap metal), though. 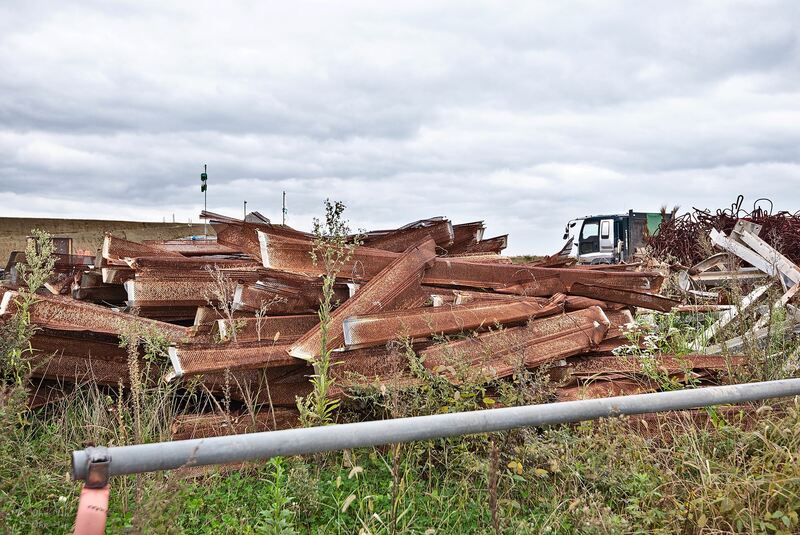 Hundreds of workers and truck drivers were busy with all the cleanup work which had been queuing up for the last years. 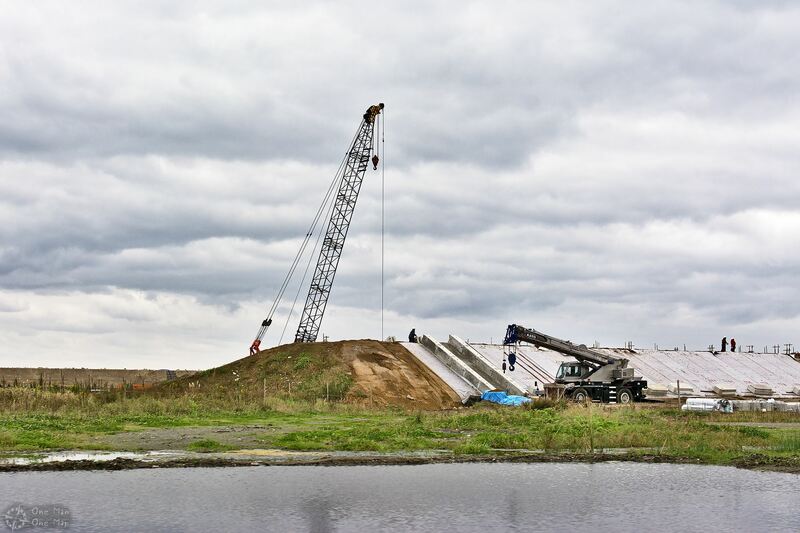 Many were also working on building the Protection Wall, a dam about 400 kilometers long and up to 12 meters in height. 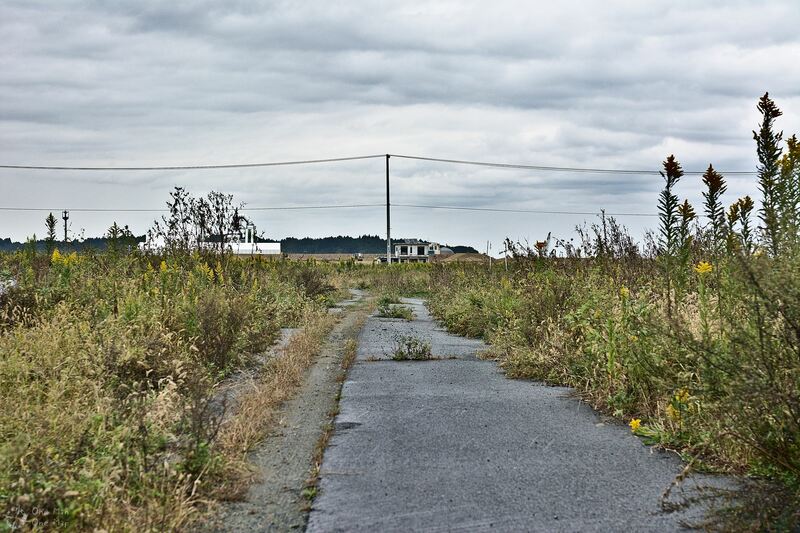 At the height of the Ukedo Fishing Port, where I took these pictures, the wall was about seven meters high. This school building is located quite close to the shore and rests on an elevated patch of land protected by concrete walls. When the disaster struck, about 200 school children ran for their lives towards the nearby hills. A small Memorial Park on one of these nearby hills commemorates those who lost their lives in the hours and days after the natural disaster, and also offers a place for the many graves. From this spot one could see the full extent of what had happened. The view used to be full of houses, but now only grassland remained. We quickly went through Namie Town by car. It had a population of 18,075 before the disaster, but in October 2017 the actual population was Zero. 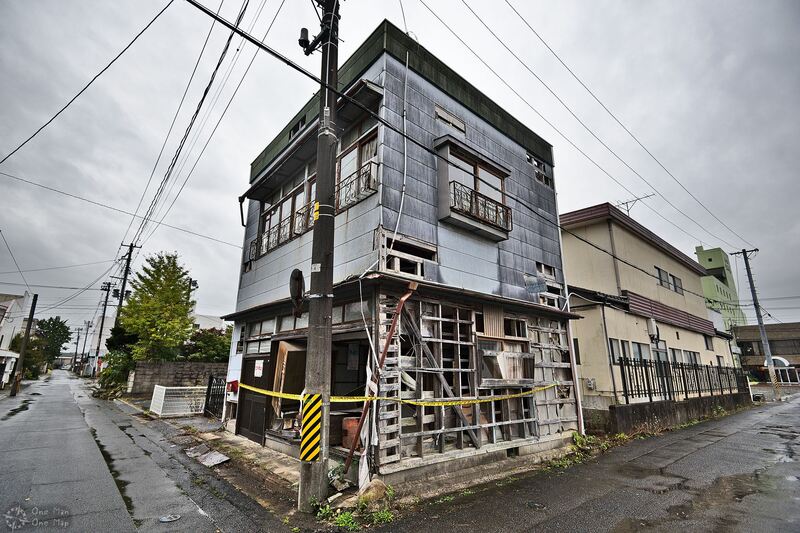 Namie would have passed as a Ghost Town if it hadn’t been for the construction workers tearing down some buildings. I have been informed by Karin that several of the buildings visible in these pictures have already been torn down by now. Namie Station (浪江駅), which is located just 500 meters north of the border to the “still-forbidden” Red Zone, had been reconstructed and was in service again. Currently it marks the southern-most stop on the northern half of the Jōban line. The train line had been heavily damaged by the earthquake, and is still split into two parts because it passes through the Red Zone. A couple of weeks after my visit, still in October 2017, Tomioka Station (富岡駅) was reopened. Nobody knows when it will be reconnected to Yonomori Station (夜ノ森駅), which is located literally just a couple of meters inside the Red Zone. 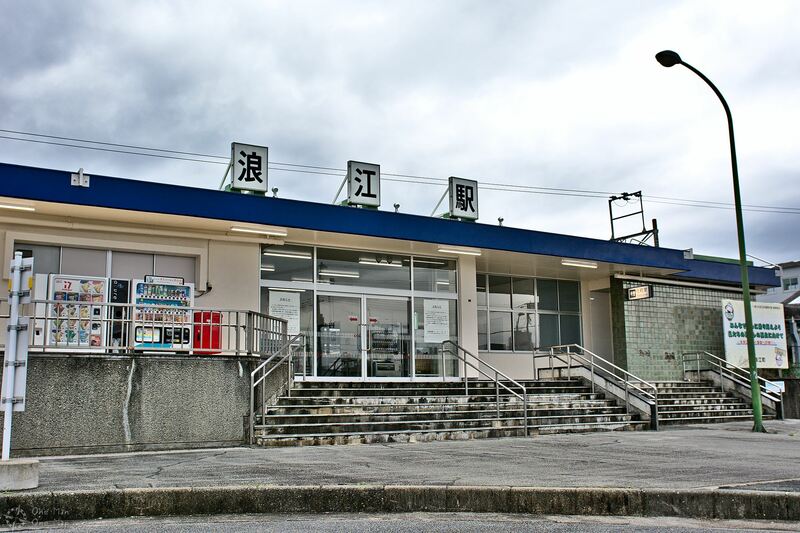 In 2010, the year before the disaster, both Tomioka Station and Yonomori Station served more than 300 train passengers per day, while Namie Station even served 734. 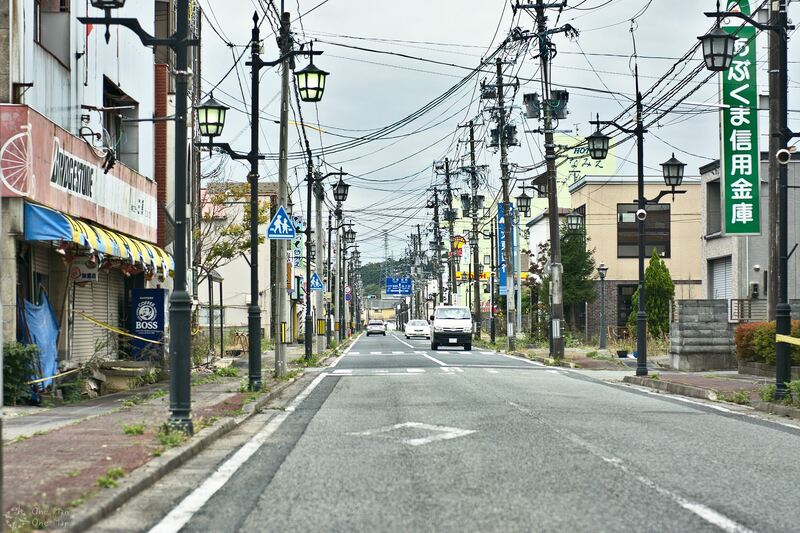 In October 2017 the population of both Tomioka and Namie was Zero. Markings like this one can be seen everywhere in Japan now and are a good reminder of just how close many locations are to the sea level. 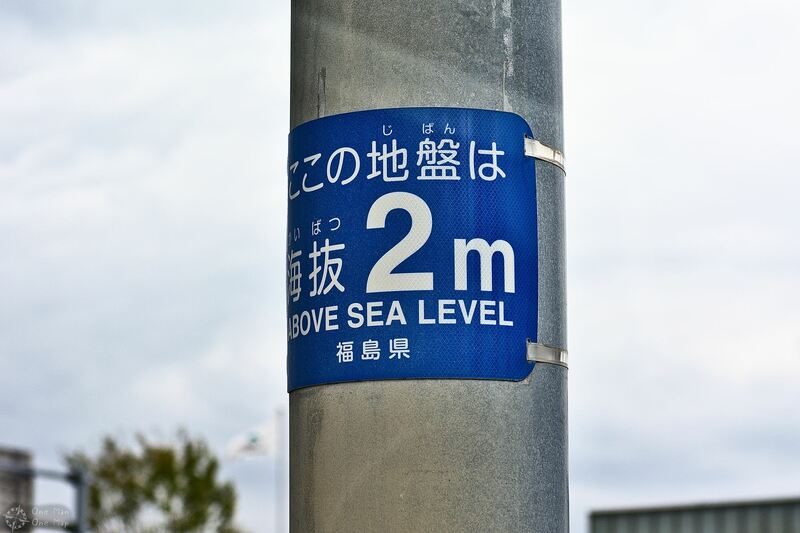 Even in Tokyo many places are located at a height of less than ten meters over the sea level. 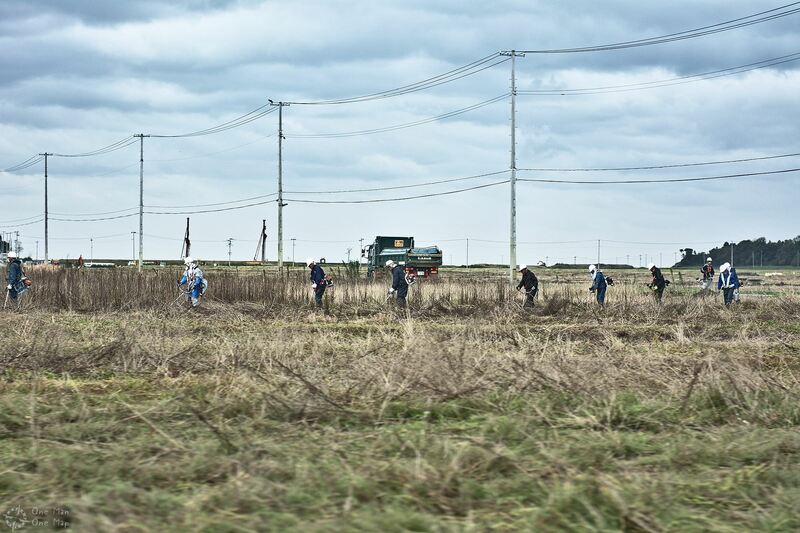 Workers were cutting back the vegetation, lots of which seemed to be rapeseed. Apparently rapeseed absorbs the radioactive Caesium from the soil only into the leaves and stems, but not into the flowers and seeds, so the seeds can still be processed and the stems discarded. This is especially important for three reasons. First, Caesium-137 has a half-life of about 30 years, so it has to be removed as quickly as possible or it will still be a huge problem for many decades. 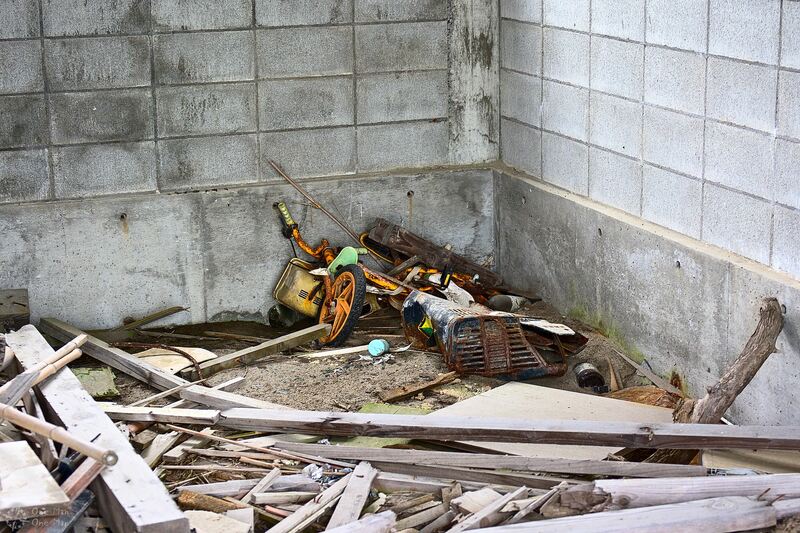 Second, many areas cannot be decontaminated easily using mechanical methods, especially fields, woods and forests. Third, if people want to come back and make a living, agriculture would be an important source of work (the Fukushima prefecture has always been an important domestic source for various fruits and crops). If rapeseed can actually extract Caesium from the soil on a large scale and store it in the plant material, but the seeds can still be safely processed into oil, it would be a potential option for the future. Also the plant matter can be used to generate electric power in biomass plants. We drove to the Odaka Community Center to meet Anbe-san. Since the hospital and most other public institutions remain closed, the Community Center had become a contact point for the few people still living in the area. It also had a few basic medical instruments so people didn’t have to drive to a far-away doctor’s office on every occasion. Anbe-san had agreed to be interviewed after Karin had explained my background and motivation, and I had prepared a list of questions beforehand. Karin translated back and forth, since neither Anbe-san nor myself spoke the other’s language well enough, and did an awesome job. I tried my best Japanese (well…), we pointed and scribbled on maps and pieces of paper, and quickly the language barrier was almost forgotten. 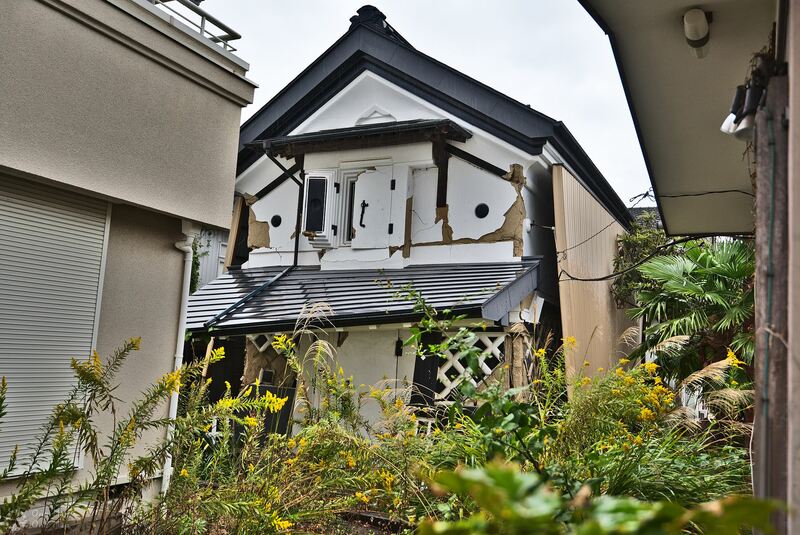 Anbe-san had lived through the earthquake, the Tsunami, the evacuation and everything that followed after. He immediately struck me as a very friendly, calm, happy and well-organized person. He had brought a bundle of books with details about the individual disasters, but knew most of the data by heart. I am still very grateful that he agreed to talk to us for a full two hours. My first question was what life had been like before the disaster. 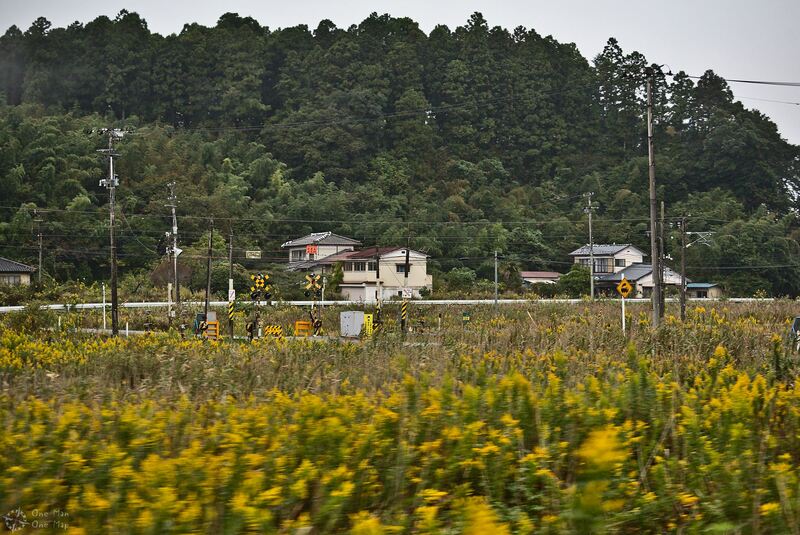 About 13,500 people had lived in Odaka, about 65,000 people in the city of Minamisōma (南相馬市) which it is part of. 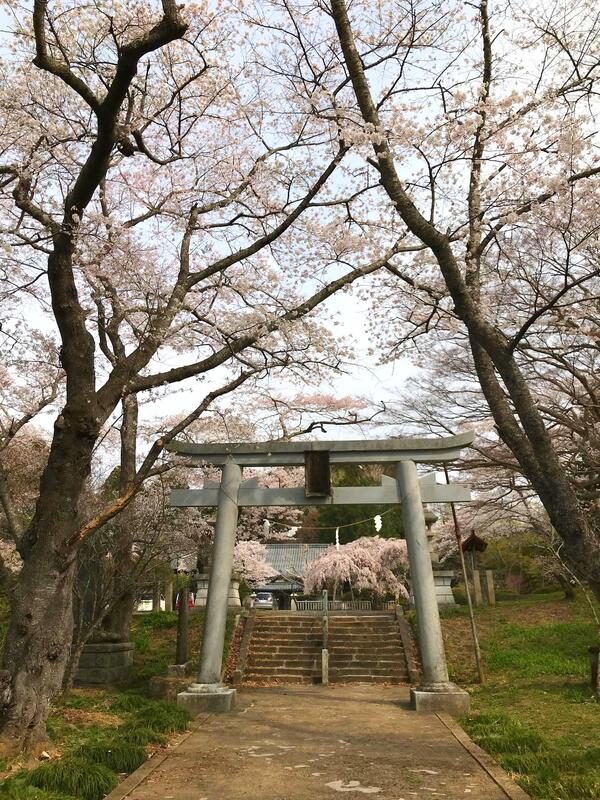 Anbe-san had been responsible for primary and elementary education before the disaster, and everything had been just about as normal as in every other place in Japan. 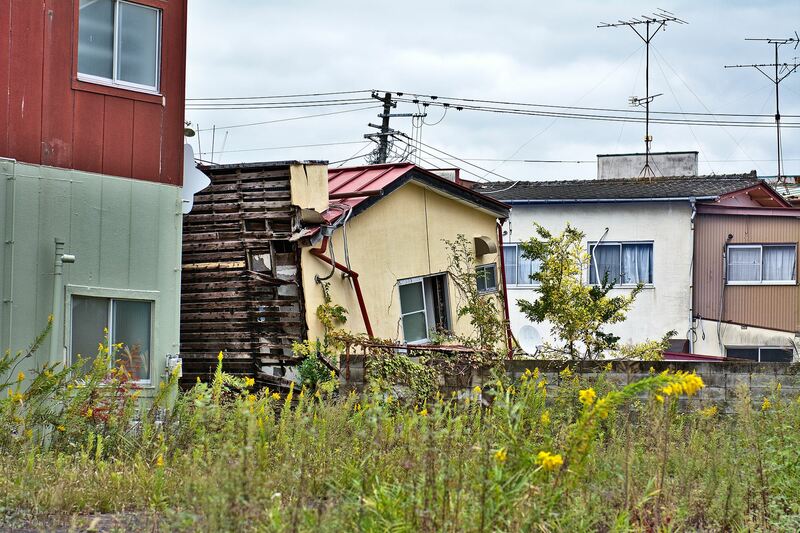 The Tōhoku earthquake on March 11, 2011 measured 9.1 on the Richter scale and was one of the most powerful earthquakes on record. The epicenter was located just 70 kilometers off the shore of the Oshika peninsula, triggering Tsunami waves up to 40.5 meters in height and shifting the whole main island of Japan 2.4 meters (!) to the east. Over 15,000 people have lost their lives, many are still missing, and more than a million buildings were damaged or have collapsed. The World Bank still refers to it as the costliest natural disaster in world history. Many power stations were damaged, and even during my visit in late 2017 people still had to save energy. 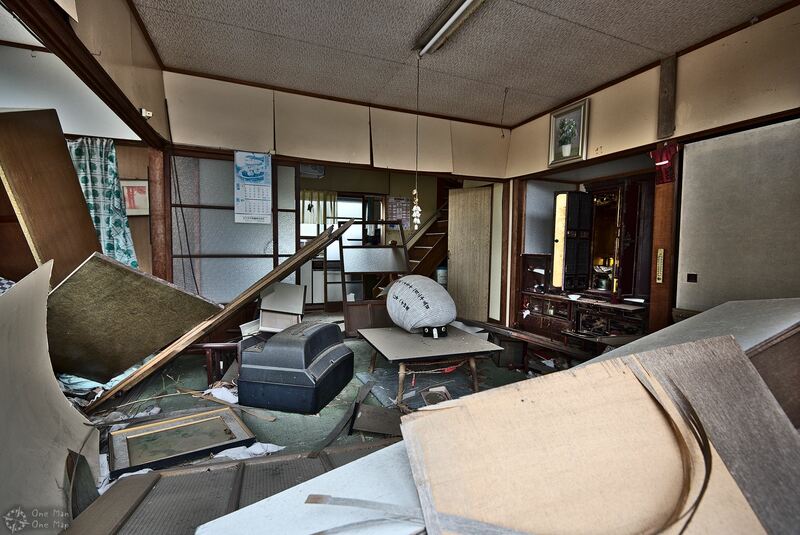 When the earthquake hit Odaka at 14:46 with a magnitude of 6.9, Anbe-san was at the City Hall. “It lasted about three and a half minutes, and lots of documents had fallen to the floor. People had to run away from the building due to several aftershocks. The mayor immediately ordered an Emergency Information Center for disaster relief to be set up. But most of the power lines had been cut, the mobile networks where quickly overwhelmed and calls had to be restricted to emergency communication, so information could no longer flow freely. I could not even reach the local schools and ask them if they were okay“. What struck me most was that up until this point both Anbe-san and Karin would have described everything as “normal”. The Japanese have gotten accustomed to natural disasters to a degree which I still cannot fully comprehend even months later. In Germany everything breaks down when there is a river flood after weeks of heavy rain, or when unexpectedly cold weather hits the country. If Central Europe was struck by a huge Earthquake – the biggest one on record had a magnitude of less than 6.9 in 1356 – I don’t think the Germans would handle it nearly as well as the Japanese did. In reality there had been numerous incidents starting right after the power plant was commissioned in 1971. 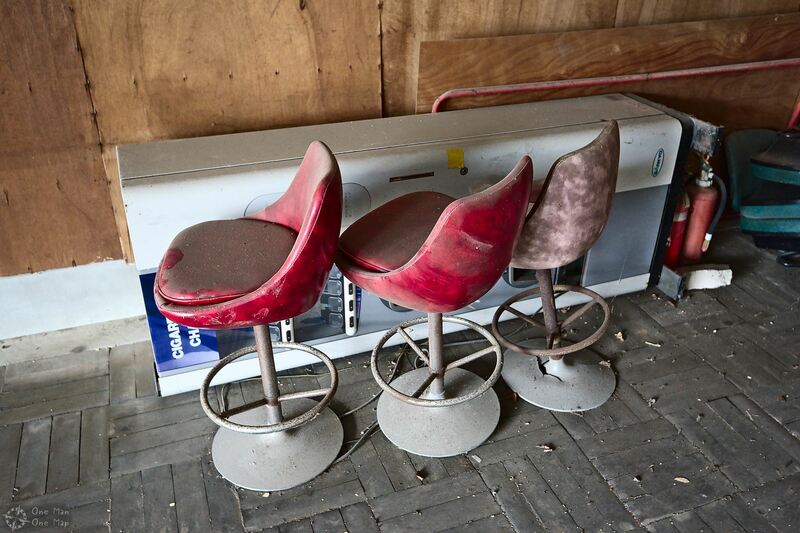 Officials at TEPCO had ignored the many warnings about the unsafety of their power plant, had failed to do regular controls and maintenance, and had even faked security reports and covered up many security-relevant incidents over decades. 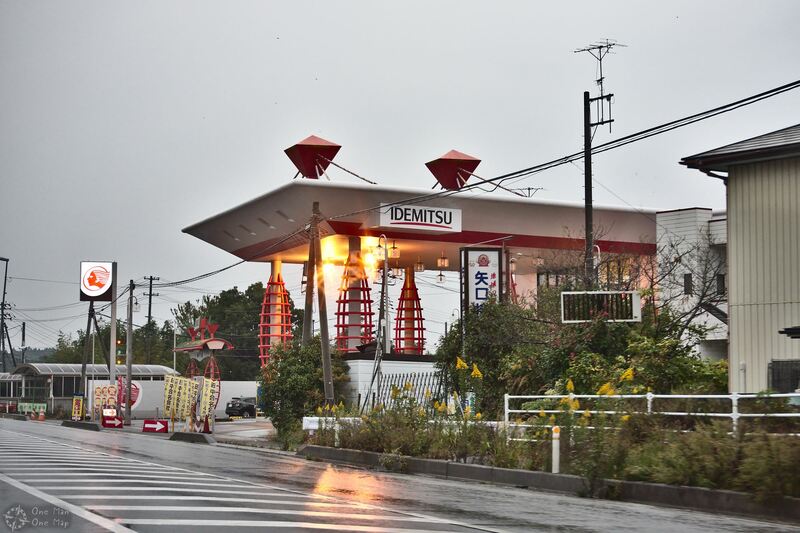 It had also been well-known for decades that the plant’s design could not withstand a large Tsunami. 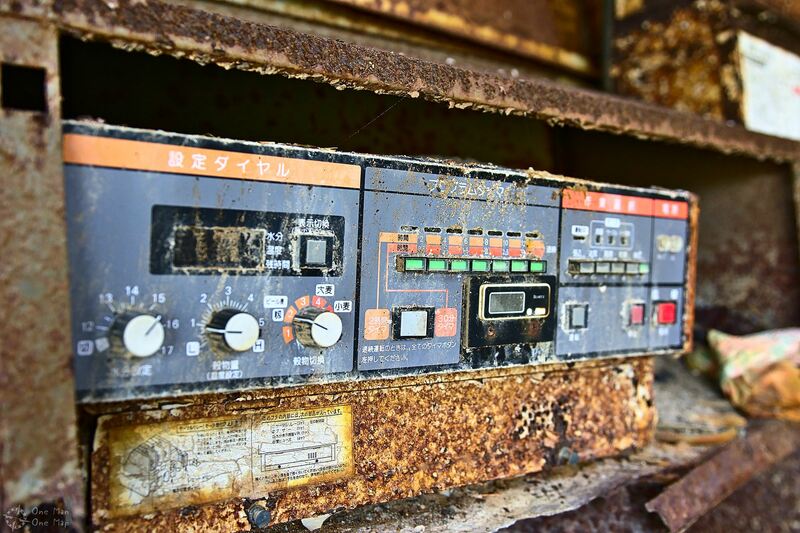 In 1991 one of the backup generators of Reactor 1 had even already been flooded by seawater, but TEPCO had only installed protective doors afterwards. 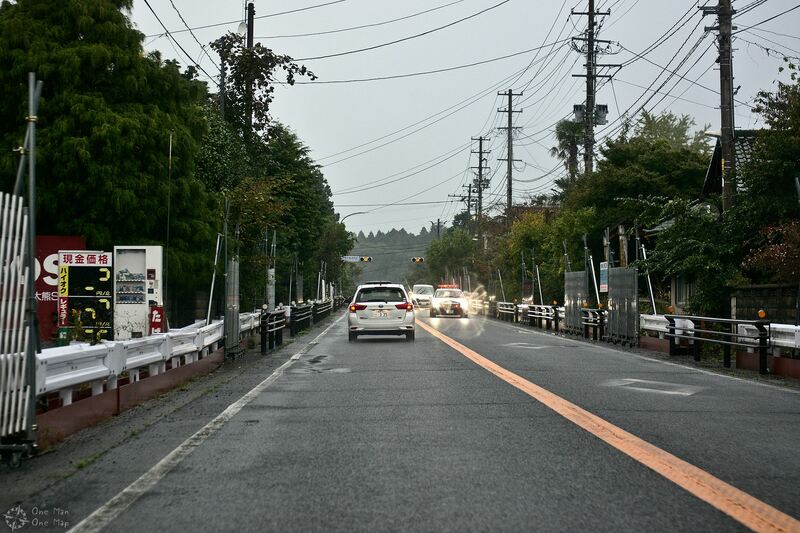 A 2008 safety study identified an immediate need to protect the power plant against Tsunami waves up to 10 meters in height. 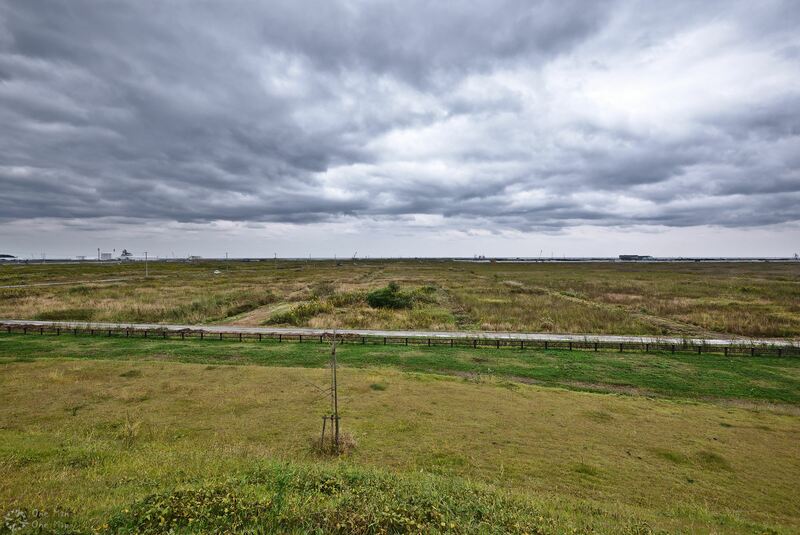 The Japanese Nuclear Safety Commission had ordered TEPCO to come up with a plan on how to fix all outstanding issues until June 2, 2011 – three months after the disaster. A map of the region around the Fukushima Daiichi and Daini Nuclear Power Plants, including some important distances. Map tiles © 2018 OpenStreetMap contributors, additional information by myself. Nuclear Power Plants cannot simply be shut off and taken off of the power grid. Most of the components (valves, pumps, measurement devices etc.) still require electric power to be operated. Spent fuel has to be cooled continuously for years, otherwise it would heat up to the point where radioactive material was released into the atmosphere. If the plant is not producing the necessary energy by itself, it has to come from the grid or backup sources like generators or batteries. 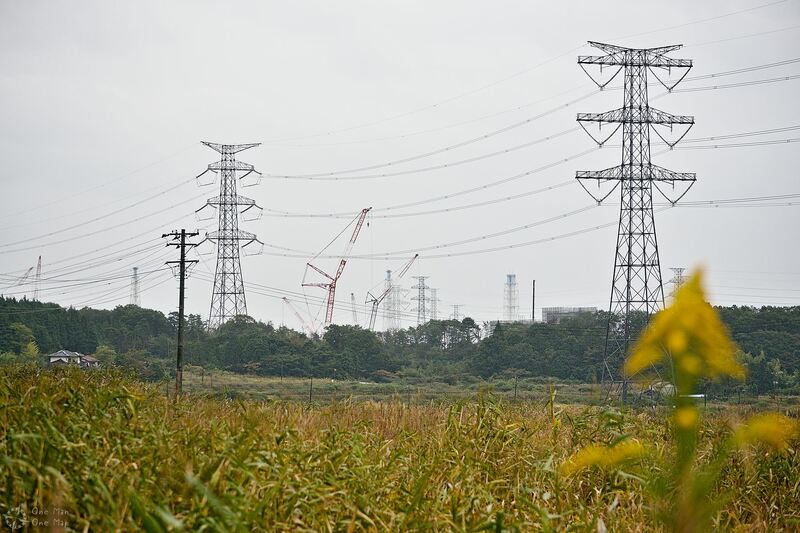 In the case of the Fukushima Daiichi Nuclear Power Plant, access to the power grid had been cut by the earthquake, and 13 diesel generators kicked in to provide backup power. Until waves between 13 and 15 meters in height hit the shore, overtopped the 5.7 meter seawall, flooded the basement of the power plant four meters high, disabled the diesel generators, and flooded and disabled a crucial switching station. 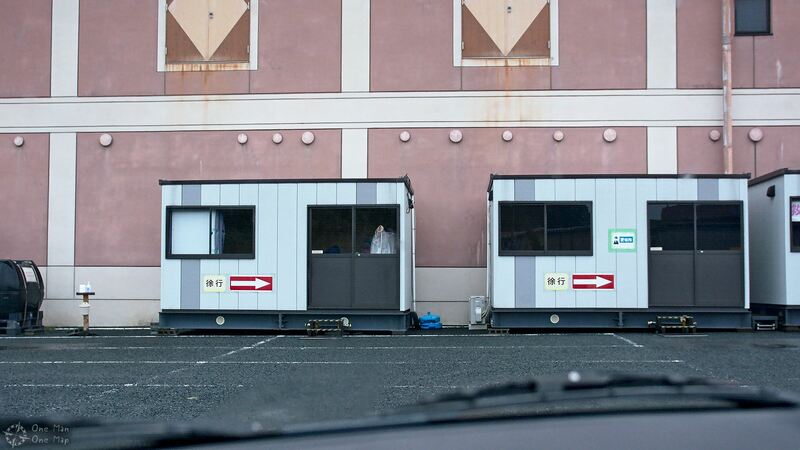 TEPCO immediately dispatched mobile generators and batteries to Fukushima Daiichi. But due to the damaged roads it took six hours until the first equipment arrived, and then it couldn’t be connected to the reactors. The connection point had been flooded and connection cables were missing. The existing backup were designed to last for eight hours and ran out around 23:00. The reactors irretrievably went out of control. 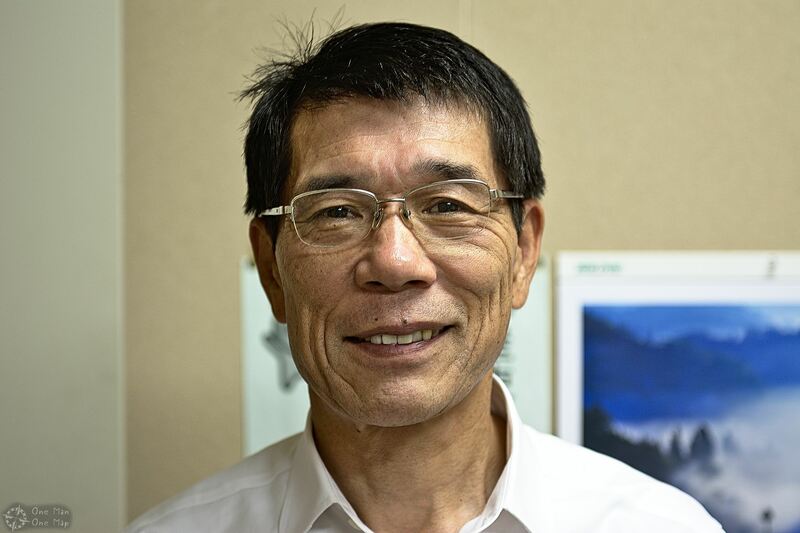 The government reacted by announcing a three-stage evacuation process, which Anbe-san remembered very well: “At 23:03 at night they told everybody living within a three kilometer radius (which is basically all of Futaba and Ōkuma) to evacuate immediately. Then it was increased to ten kilometers, then to twenty“. People living within a tree to twenty kilometer radius were told to be on alert to be evacuated, and those living within a twenty to thirty kilometer radius were told to stay indoors. 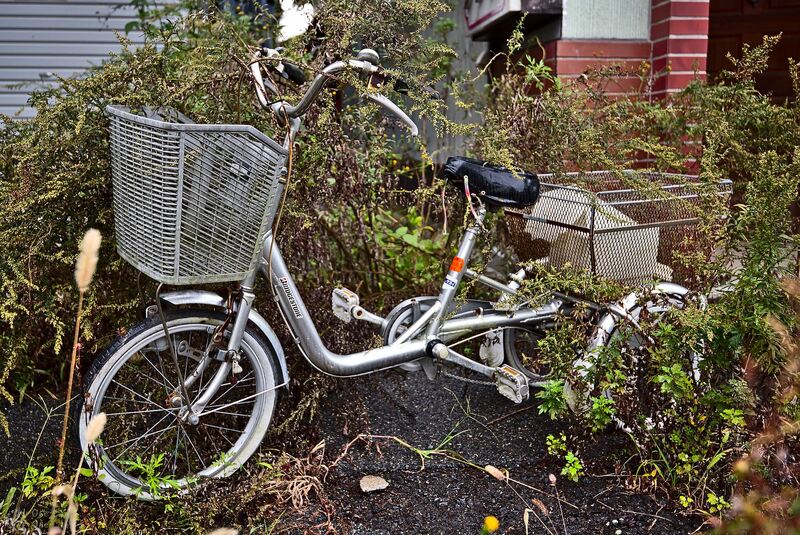 After the earthquake and Tsunami, about 300,000 people all over Japan had to be evacuated. Suddenly this number was increased by another 170,000 people fleeing from the vicinity of the Nuclear Power Plant. Many of them had to leave within a single day, and most without a real plan. Residents of the Ōkuma and Tomioka Towns had prior training and evacuated South. 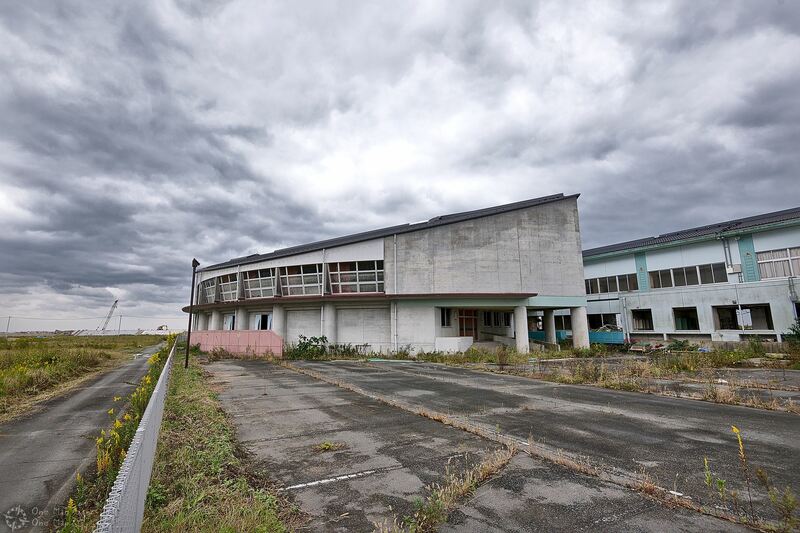 Most of Namie Town lies within ten kilometers of the Nuclear Power Plant, but also about four kilometers from the seashore, so its population had not trained for nuclear disasters or Tsunamis. 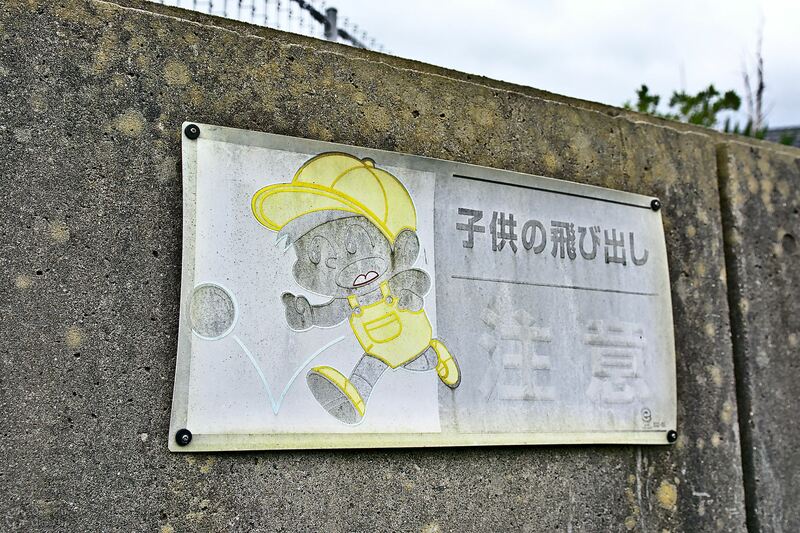 Many fled to Minamisōma City, but at 15:36 on March 12 (nearly exactly 24 hours after the Tsunami) a bubble of hydrogen exploded at reactor unit 1, followed by officials mentioning the possibility of a Meltdown the next day. 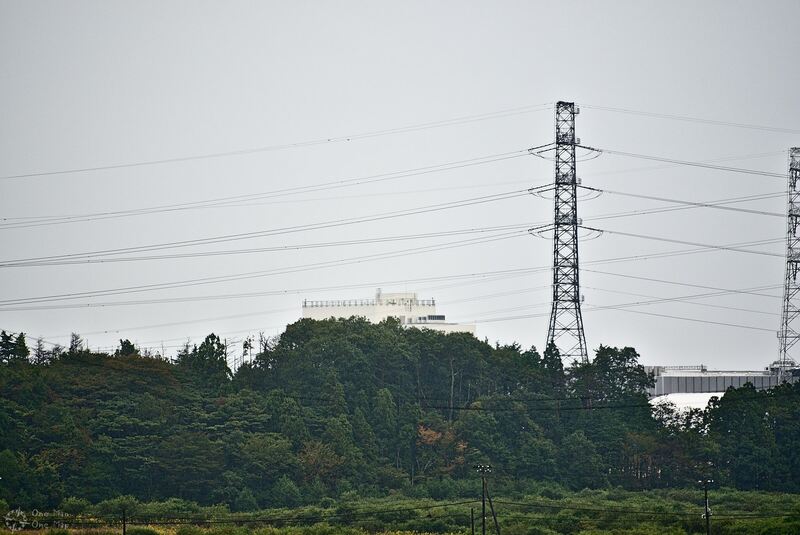 TEPCO later admitted that the meltdown in reactor unit 1 had already started five hours after the Tsunami because the backup batteries had been damaged. By the time the rumors started to spread, the reactor was already releasing radioactivity into the environment and the fuel had melted through the bottom of the containment vessel. Karin had brought a map, and Anbe-san started to explain. “The wind usually blows from West to East in the Winter, which is was happened when the radioactive particles were released into the air. So about 90 percent of the radioactive material was blown out onto the sea. But later the wind changed its direction to Northwest, and it was raining that day, so most of the material came down within about 100 kilometers of the Nuclear Power Plant and contaminated the soil“. Some of the radioactive particles even made it as far as Tokyo. A nuclear disaster in Central Europe would be much worse, since there is no sea. The fallout would be one hundred percent – not just ten. Two more explosions at reactor units 3 and 4 followed. On March 15, way too late, everybody within a 20 kilometer radius was finally forced to leave. 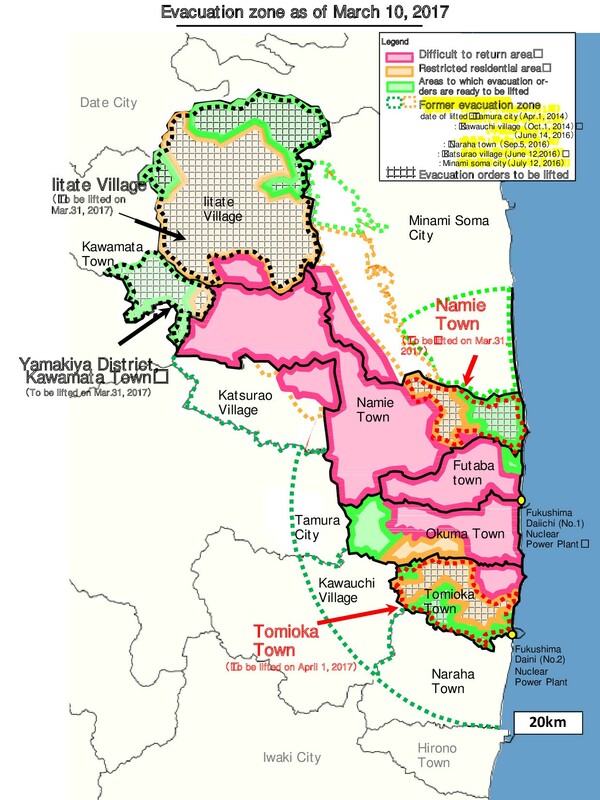 This now also affected parts of Minamisōma itself, namely Odaka and the southern part of Haramachi. Foreign governments worked with completely different numbers. The U.S. Embassy advised Americans to leave all areas within 80 kilometers of the nuclear plant, Spain advised 120 kilometers, and the German embassy even advised its citizens to leave Tokyo (about 230 kilometers away). 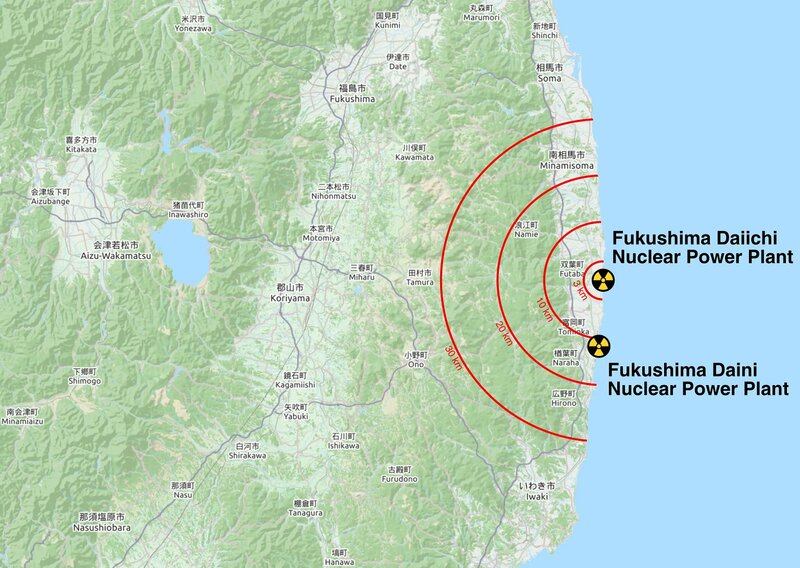 Gregory Jaczko, the chairman of the United States Nuclear Regulatory Commission, openly said before the United States Congress that he didn’t believe the Japanese were telling the full story, and that he would advise a much larger evacuation radius. A map of the larger Fukushima prefecture area with the radiation levels recorded in the SAFECAST database as of March 22, 2018. Licensed under the CC Creative Commons BY-NC 3.0 license. 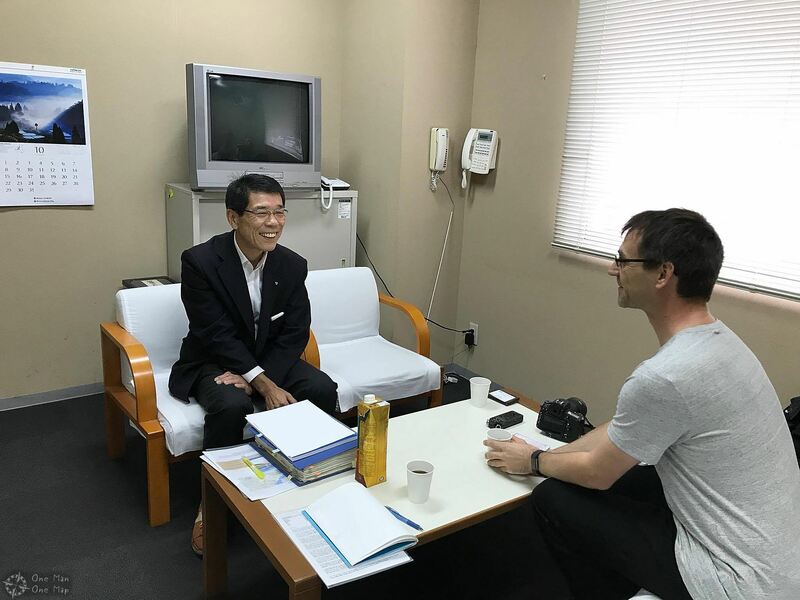 He also explained to me that usually there are pre-made agreements between Japanese prefectures for cases like these, so the evacuees know where to go and the cities taking them in know what and whom to expect. “But there were no agreements for Minamisōma City. The prefectural governor would have had to ask other prefectures, but that didn’t happen. So the mayor of Minamisōma, Katsunobu Sakurai, started to ask neighboring cities and prefectures directly“. Later I read online that Mayor Sakurai’s superiors had told him numerous times that there was no reason for panic, but he went as far as telling the BBC that he had been “ignored and then badly misled, and as a result the people were abandoned here to die“. An incredibly strong-worded message for a Japanese official in this position. The evacuees were scattered all over Japan, which posed numerous problems for them. People had to find new homes and new jobs, the children and young adults had to find new friends and go to new schools. “The Japanese school year ends in March and starts in April“, Anbe-san told me. “So at least all the exams had already been written and nobody lost a year of school. But they were now away from their friends, had to go to new schools, and some of them were traumatized, which did create psychological stress“. Many evacuees understandably still cannot forgive TEPCO and the government for an “unnecessary” disaster they think could have been prevented. 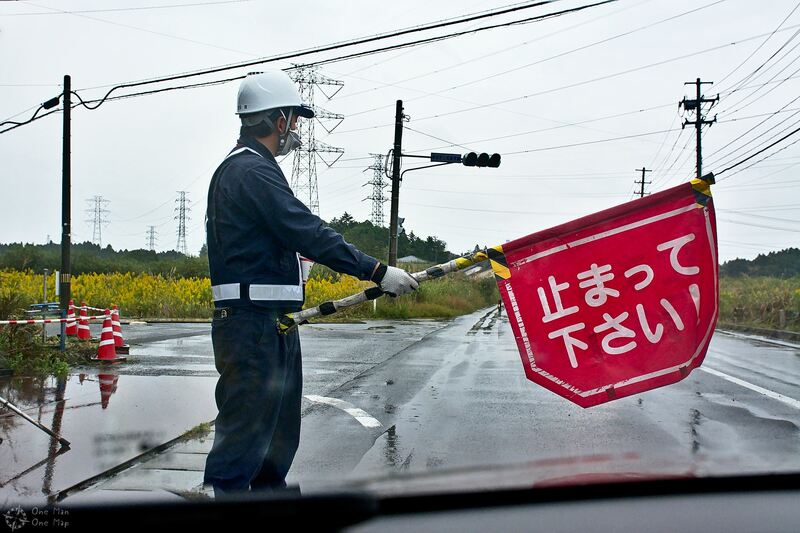 The Fukushima Daini Nuclear Power Plant just 30 kilometers south of Fukushima Daiichi had also been damaged by the earthquake and flooded by the Tsunami, also leading to an evacuation order for a 10 kilometer radius. 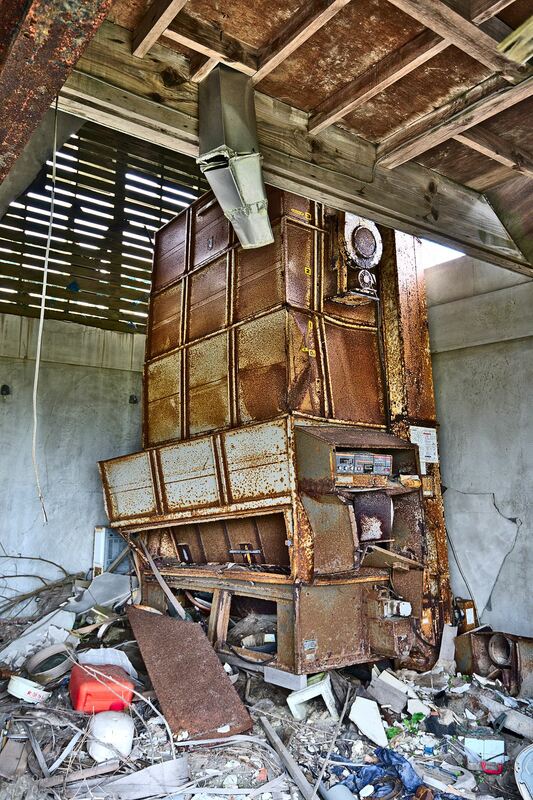 But the damage was not as catastrophic as in Fukushima Daiichi, and workers managed to avoid a meltdown. 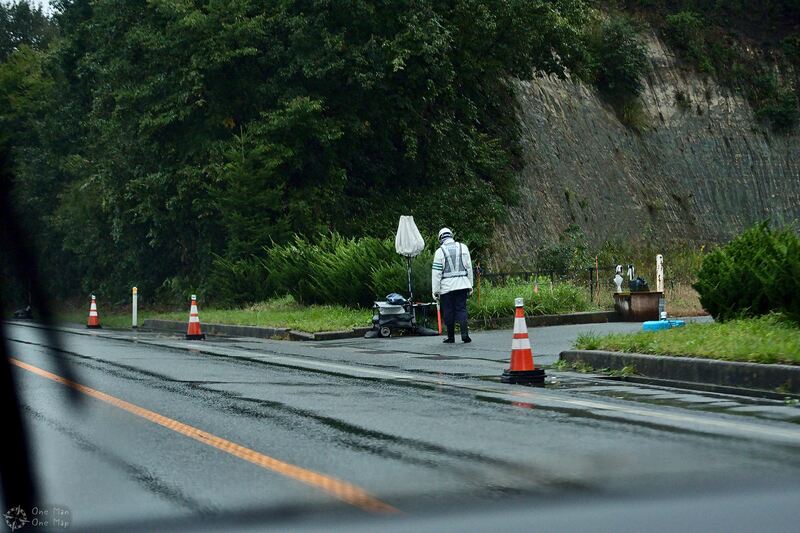 Since there was no serious contamination, the evacuation order was already lifted in August 2012. 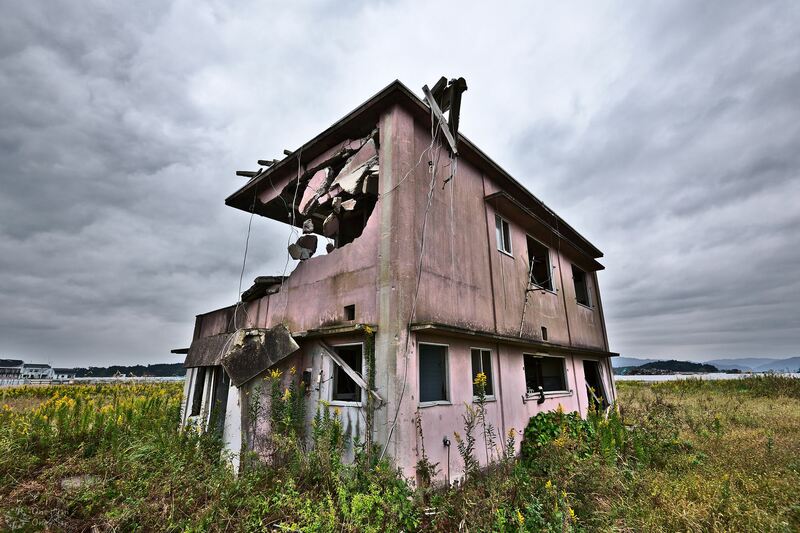 The Former residents of the Fukushima Daiichi Evacuation Zone weren’t as lucky. Talks about lifting the evacuation order started as early as 2012, but the contamination was much more widespread than previously thought, the radiation levels remained high, and decontamination either took longer than expected or was not practical (e.g. in the case of forests). 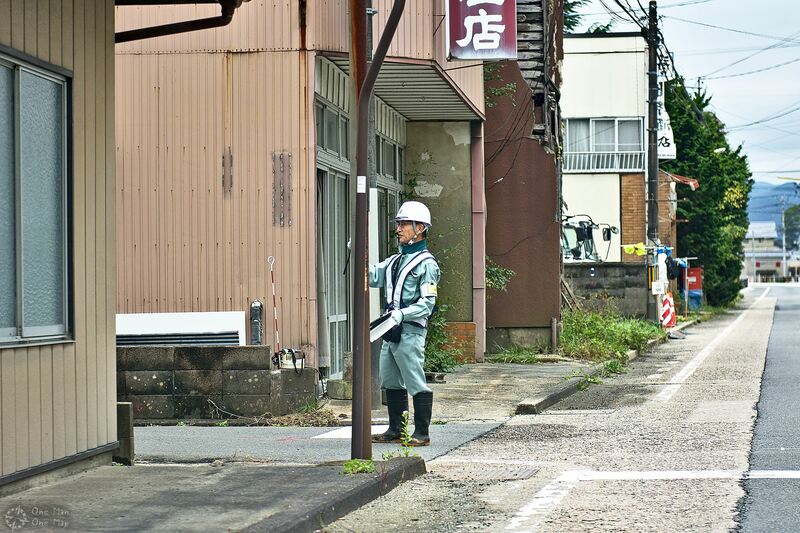 The mayor of Ōkuma asked his town to be declared a no-go zone because it was already clear that no-one could return in the foreseeable future. 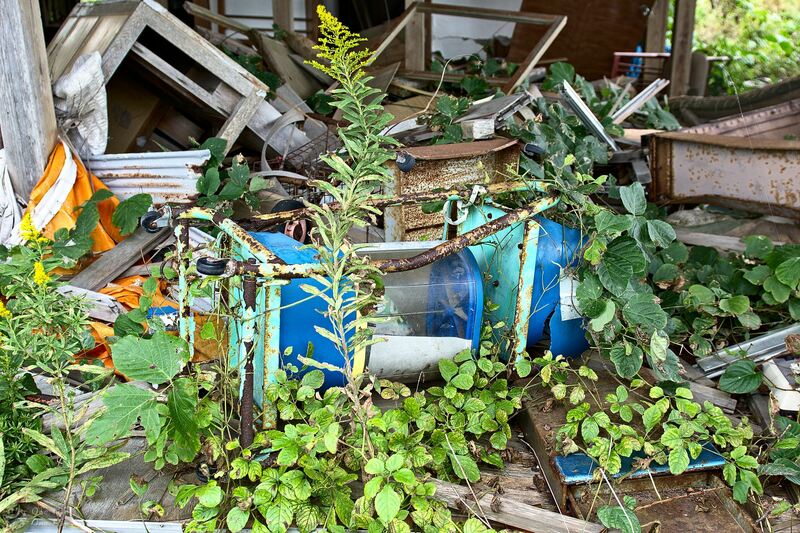 The total costs for decontamination, decommission and compensation are estimated at around US-$ 200 billion, of which TEPCO is expected to cover around 65 billion. In 2015 the government divided the original 30 kilometer evacuation zone into three sub-zones distinguished by their colors. In the Green Zone the radiation levels have been declared to be low enough for residents to be allowed to return to their homes and live indefinitely in the area. In the Orange Zone the levels are low enough to walk around in the open without protective gear, but people can’t live there permanently. The Red Zone is basically a no-go-zone with radiation levels so high that nobody should stay there longer than necessary. 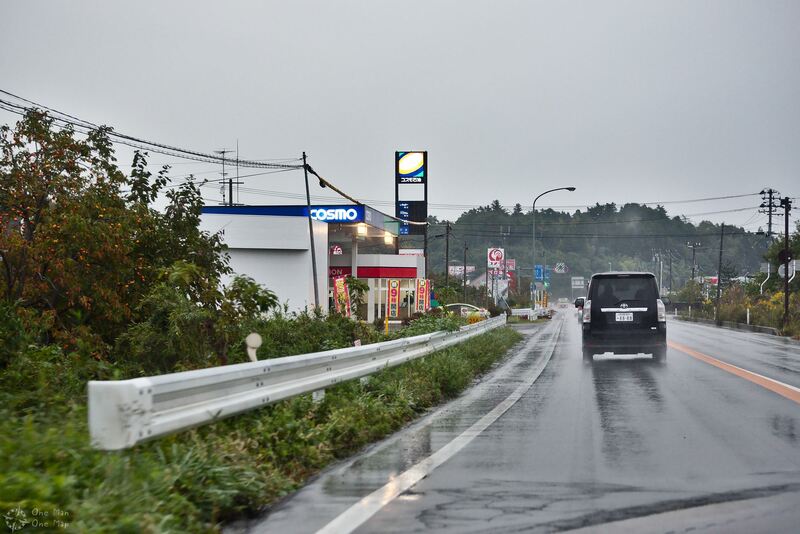 On Route 6, which connects Namie to Tomioka and passes through the Red Zone, people are requested not to slow down or even leave the car. 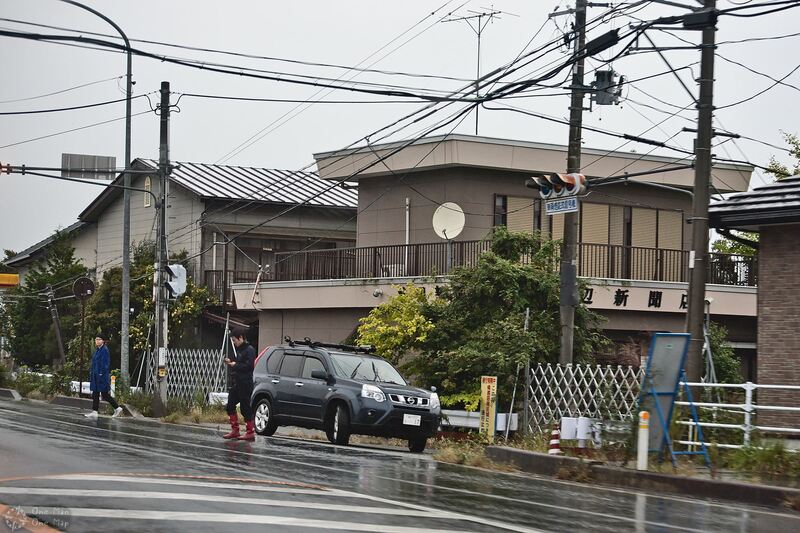 The Evacuation Order has since been revised several times to account for the falling radiation levels, for example in the first parts of Odaka the order was lifted in 2016. After the last update in early 2017, less than half of the area inside a 20 kilometer radius around the Nuclear Power Plant is still marked as Orange or Red Zones. But the Red Zone actually stretches quite far to the North-West, at some points even outside a 30 kilometer radius. The necessity for this is confirmed by measurements from both the government and the SAFECAST community. 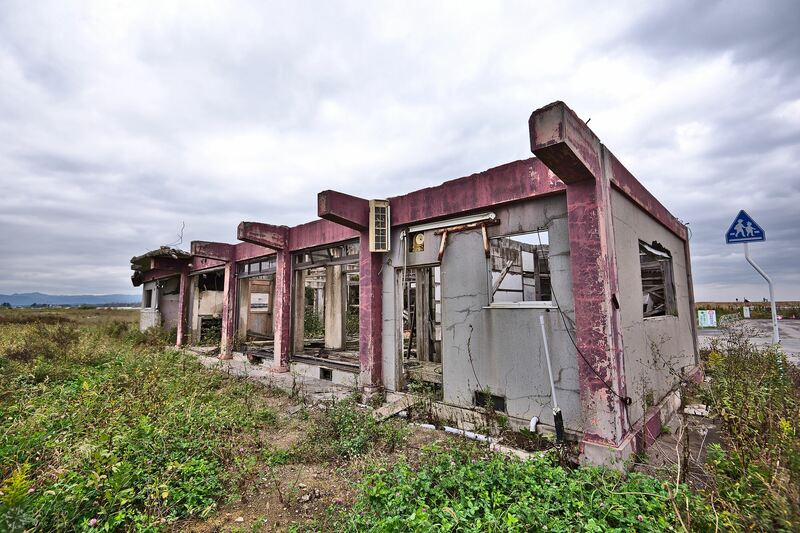 In October 2017 about 55,000 people still lived as refugees, which was about three percent of the population of the whole Fukushima Prefecture. Now is probably the moment to briefly talk about radiation and radioactive materials, so you get an understanding of what all those colors and numbers mean. (If you just came for the pictures, scroll down a little bit). A map of the radiation levels recorded in the SAFECAST database as of March 22, 2018. The green lines mark the Red Zone. Licensed under the CC Creative Commons BY-NC 3.0 license. First off: not all types of radiation are bad. 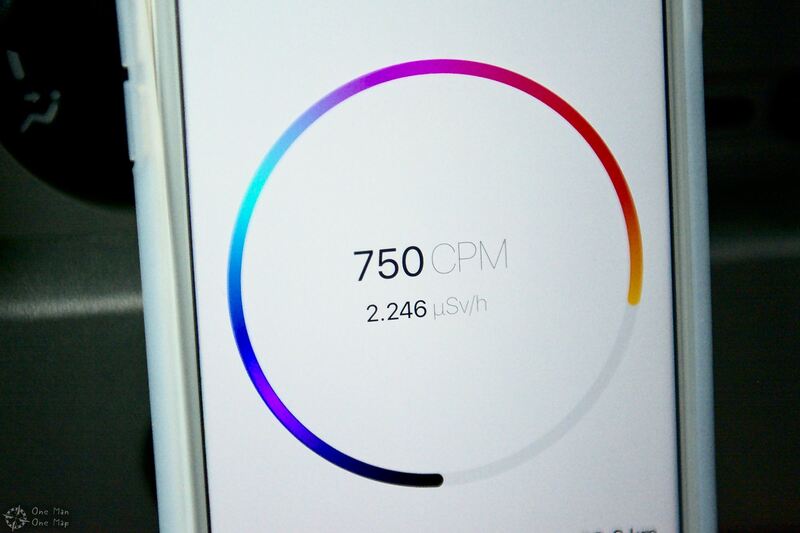 Your smartphone for example would have a very, very hard time to come up with enough energy to harm you, and even your microwave (which has enough power) just heats stuff. But some types of radiation particles have enough energy to cause chemical effects (like Ultraviolet light) or knock electrons out of atoms (like Ionizing Radiation from nuclear decay), and this is where it gets dangerous. The more of this is absorbed by live tissue, the more damage it causes – causing sunburn, cancer, the Acute Radiation Syndrome and other health problems when it gets too extreme. Radioactive elements are unstable and break apart at some point (they “decay”), but there are a huge differences when it comes to how long it takes until this happens, and what exactly happens during the decay process. Some elements are so unstable that they will decay nearly instantly, while others can look stable for an extremely long time. The most common measure for the average time until an element decays is its “half-life”. If you put a given amount of radioactive material in a box and come back after its half-life has passed, only half of it (and half the radioactivity) will still be there. During a decay the nucleus loses something. Either an alpha particle breaks off and flies away (alpha radiation), an electron flies away (beta radiation), or energy is emitted in the form of radiation because the nucleus has too much (gamma radiation). Alpha radiation can be stopped by a piece of paper or the dead cells on the top of your skin. Beta radiation requires a metal sheet to be shielded off. Gamma radiation is only kept at bay by several centimeters of lead. But even if alpha radiation can be stopped with a sheet of paper, it will still wreak havoc if it gets too close to living tissue, for example when radioactive material is inhaled or ingested. This is the reason why radioactive Radon gas is such a problem. The human body can cope with a little bit of ionizing radiation since there is a constant stream of background radiation coming from space, but there are limits. The most well-known measurement device for radioactivity is the Geiger counter, but it only counts every ionizing particle it sees, and human tissue reacts differently to different types of ionizing particles. What you actually want is a measure for how harmful the particles you are counting is to human tissue. This measure exists, and its unit is the Sievert (Sv). 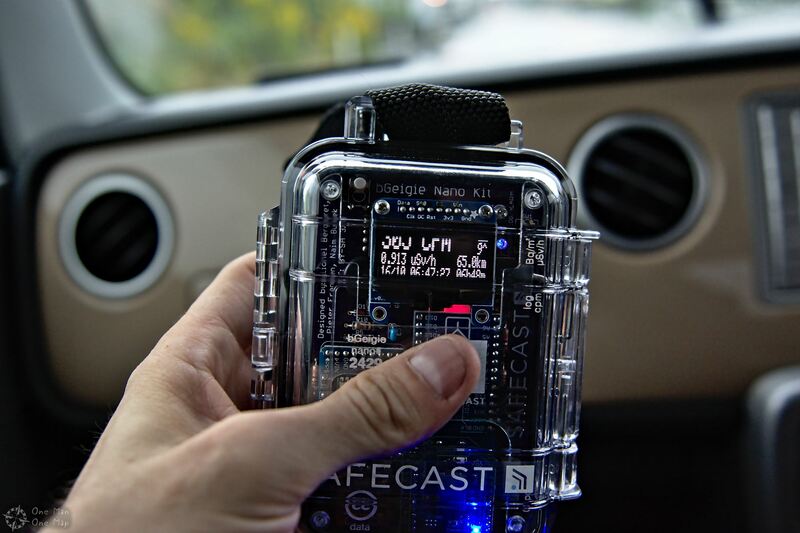 Both the bGeigie Nano Geiger counter and the SAFECAST map use microsieverts per hour (µSv/h) as a unit. Airplanes are closer to space in-flight, and the natural background radiation up there increases to about 3 µSv/h, so on an eight-hour flight between London and New York your body accumulates around 0.02 mSv. That’s about as much as a chest X-Ray. But on the flight you are subjected to a low dose over eight hours, while the chest X-Ray just takes five milliseconds. High amounts of radiation within a short time are much more dangerous than low amounts over a longer time. This is why there are no radiation limits for flight attendants and passengers, but you are supposed to limit X-Ray exposure to the absolute minimum. 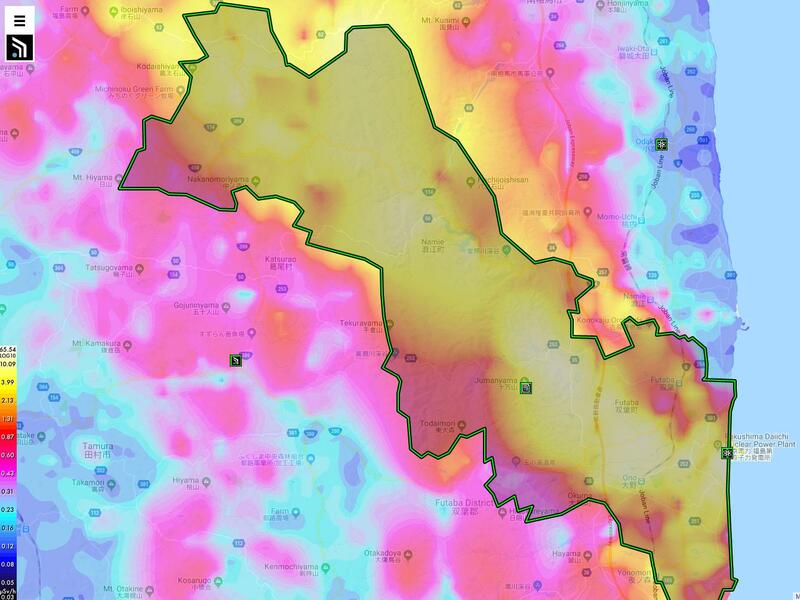 If you look at the SAFECAST map, many areas outside the Red Zone have levels way below 1 µSv/h. Most people probably don’t realize that getting on a plane would be a much worse decision than to walk around in Minamisōma. But inside the Orange and Red Zones the levels quickly rise above 5 and even 10 µSv/h, and those are measurements on the streets. Supposedly they are much higher in the woods. The Japanese government has increased the radiation dose limit for civilians from 1 to 20 mSv per year after the nuclear disaster, the normal limit for workers in the nuclear industry. If someone comes back to live in one of the Green Zones at a place which gets 0.1 µSv/h, that amounts to just ~9 mSv per year. If we assume some parts of Namie get as much as 0.5 µSv/h, there the yearly limit would be reached after less than six months. Inside the Red Zone you could reach your yearly limit in less than three months, and inside the Nuclear Power Plant there are spots in which you would accumulate a lethal dose of one Sievert in less than an hour. 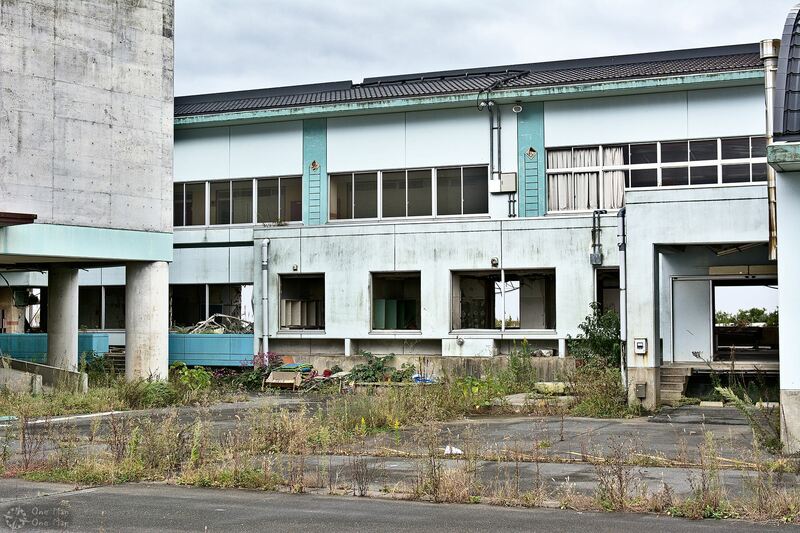 “The Minamisōma City Government projected that the population will rise to about 4,700 people (out of the original 12,800) again, but as of now we‘ve got just 2,200. My personal guess is that about 3,500 to 4,000 people will be reached again within several years, but I don‘t know if we can go beyond that. The people who are now living here are also different people. All generations of the same families used to live here, children, adults and elderly people. Now just the elderly remain.” The official statistics paint the same picture for the whole affected area. On average about 20 percent of the population have decided to come back. Schools reopened for the April 2017 term, but only four percent of the students have returned to their former schools. Japan already has a “super-aging” society, but in the Evacuation Zone this problem is currently even worse. Based on my experiences in other parts of the world I made various suggestions as to how the government could convince people to come back, for example by lowering taxes for the residents or even turning the Green and Orange Zones into Tax Free regions. “We have offered subsidies to lots of companies to restart business here, for example by lowering taxes or by offering to build the infrastructure for factories. But the decision to lower taxes is not up to the City Government, the Japanese Government has to make it“. I thanked Anbe-san for his time by handing over a bag with German sweets and we went back on the road. 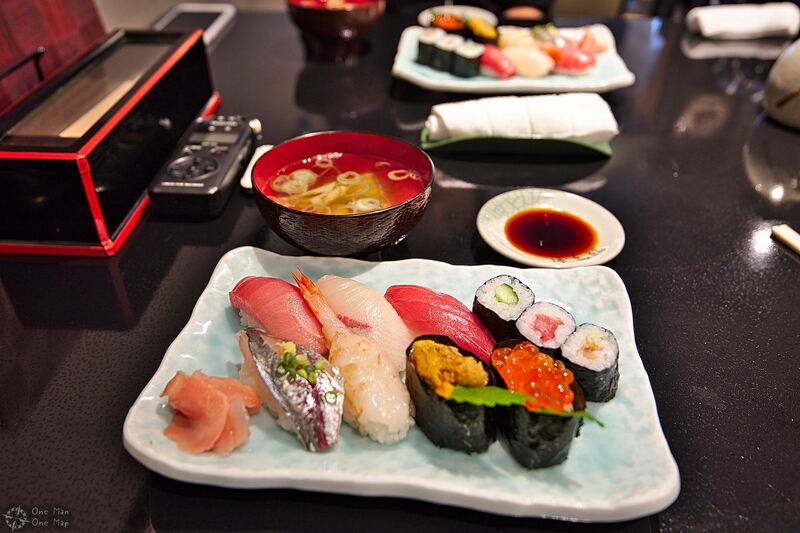 Before we went to further explore the area, we stopped at one of the three remaining restaurants for some very delicious Sushi. 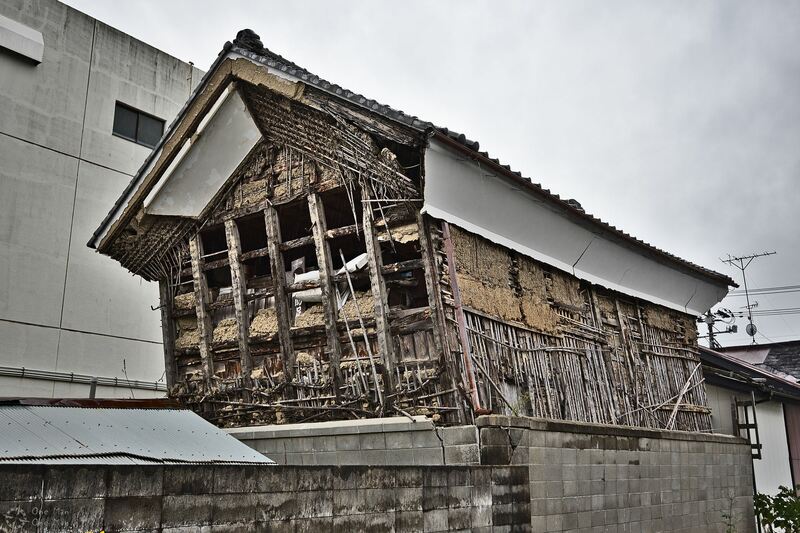 On the way to Namie we came across more damaged houses close to the shore. My brain quickly started to accept them as “normal”, but the difference to the beautiful places I had seen in the days before could not have been any bigger. 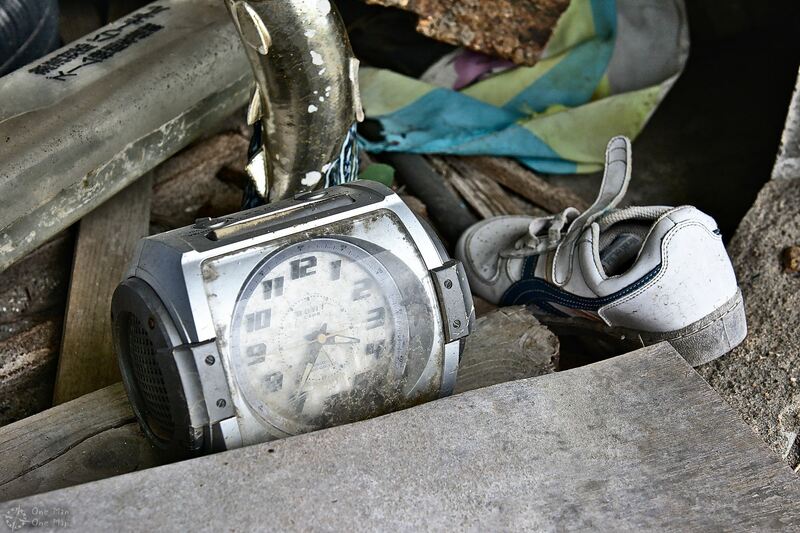 It was very sad to see so many personal items left in the ruins. 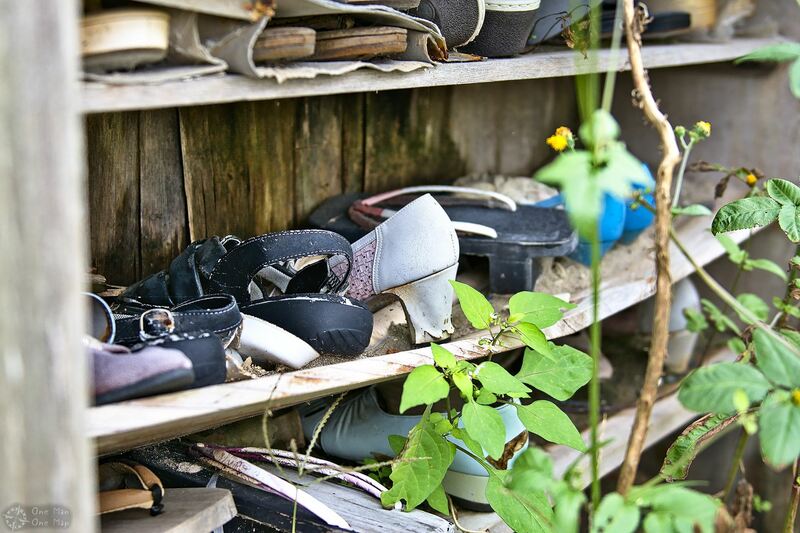 Shoes, bicycles, radio clocks, household items, sometimes even personal documents like certificates. The building close to the house seemed to have been a barn housing agricultural machinery. 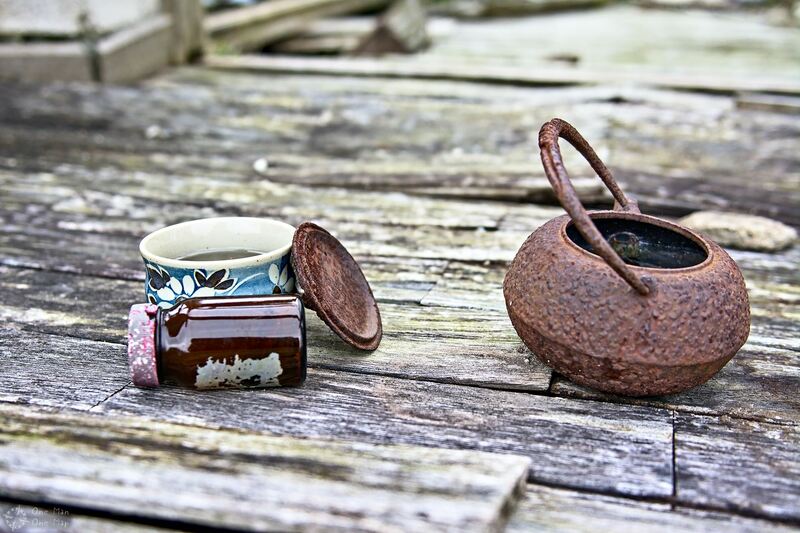 Machines had fallen to the ground, the metal was no longer protected from the elements and rusting slowly. 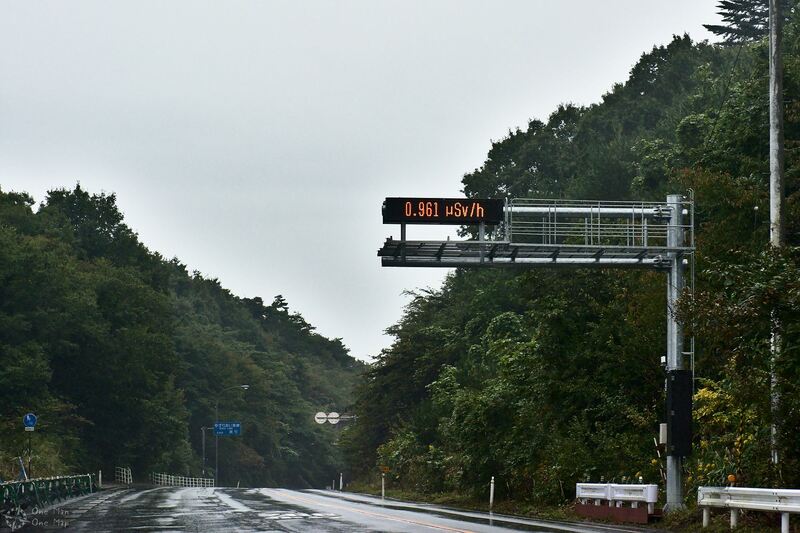 This official measurement station displayed a radiation level of 0.053 µSv/h, which is even less than the 0.1 µSv/h I assumed for the Green Zone in the prior example. A whole neighborhood with lots of houses used to line this street, but after the Tsunami only a few ruins remained. 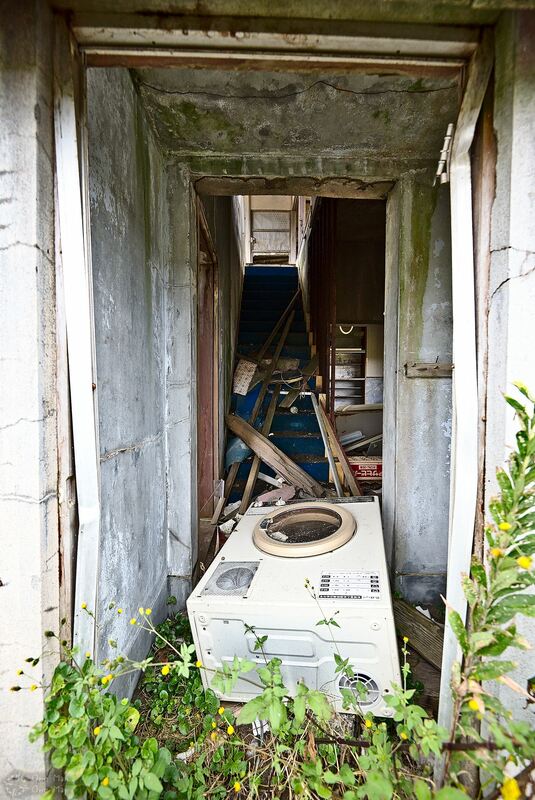 I wonder if this washing machine had always been located in the house entrance? Probably not, which hinted at the forces which must have been at play here. I can’t even lift a washing machine on my own, but the earthquake and Tsunami apparently did so with ease. On our way we passed several large scrapyards. It’s not just that there is a lot of debris, but some of it is also contaminated. 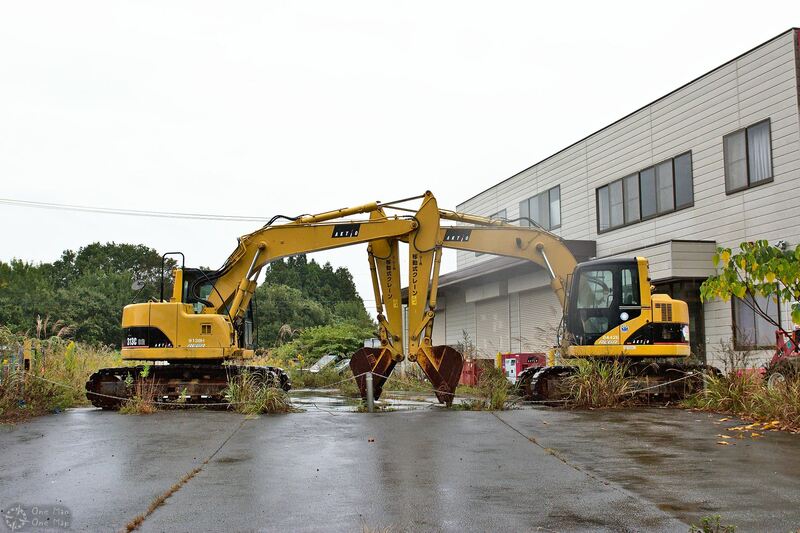 Most of Futaba will most likely remain a permanent no-go zone due to a large number of storage tanks installed to hold highly contaminated water from the Nuclear Power Station. 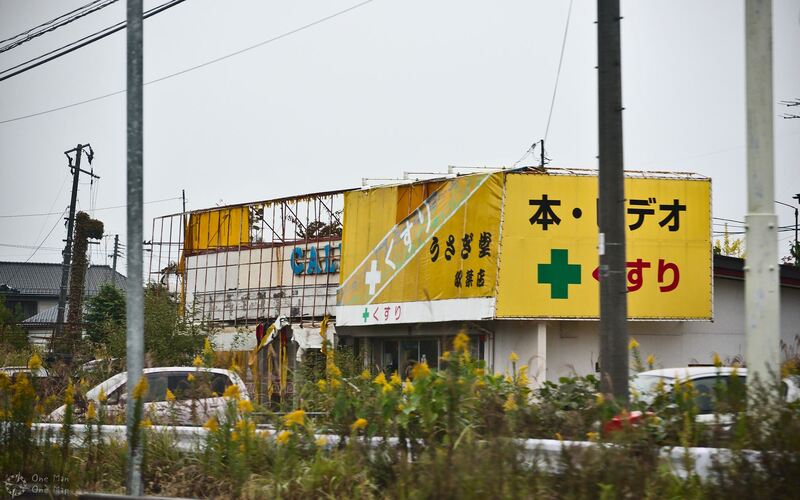 Namie Town has become somewhat of a symbol for the whole area since it is easily accessible, but at the same time many of the damaged buildings in the Western part of the town are within the Orange Zone and people are not allowed to live there permanently. 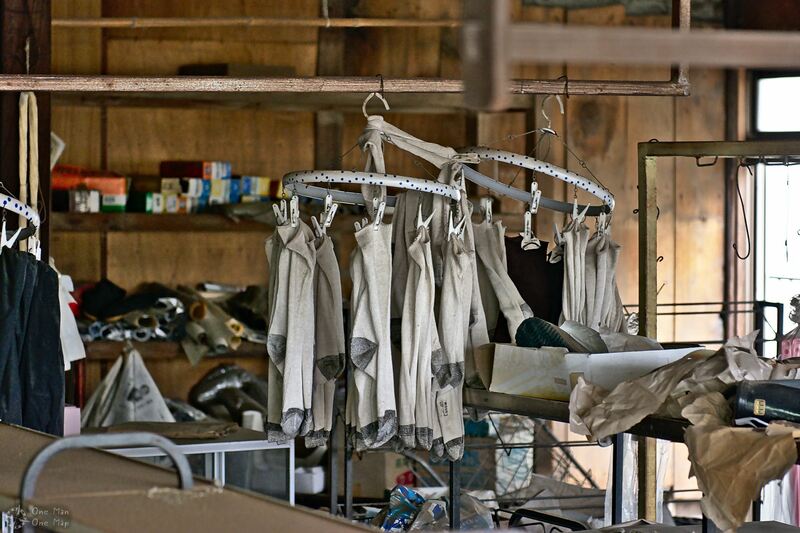 Pictures of this “Ghost Town” have popped up on various news outlets and the Internet over the last years. 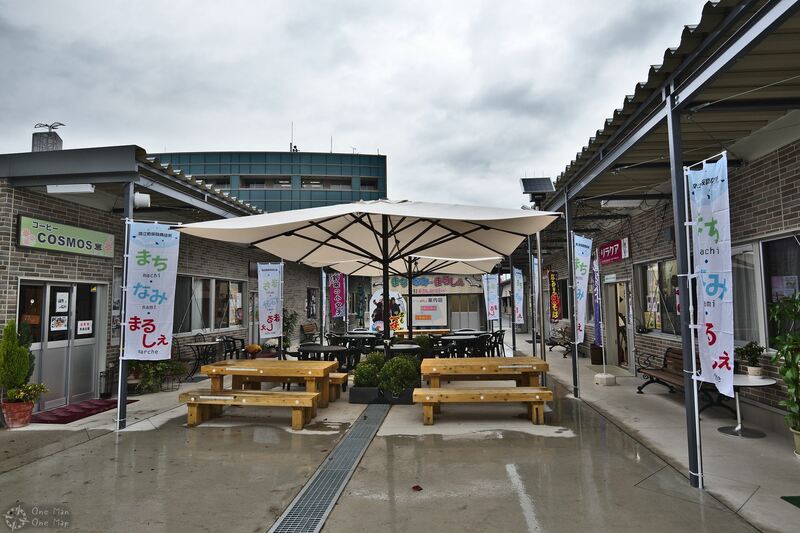 To facilitate the lives of those living and working in the vicinity, the City Government had set up this little square. The buildings on the left and right housed basic amenities like a café, a cleaner, and a small supermarket. This was especially important since the large stores never reopened. 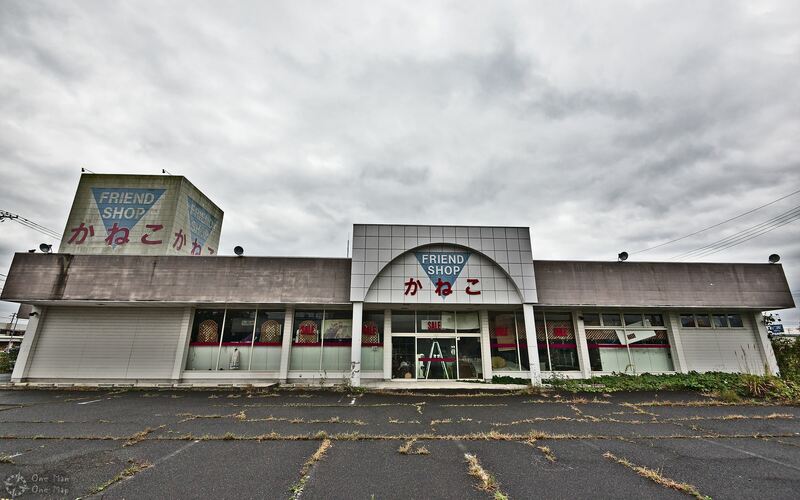 Karin has informed me that this “Friend Shop” has been cleaned out in the meantime and is about to be torn down. 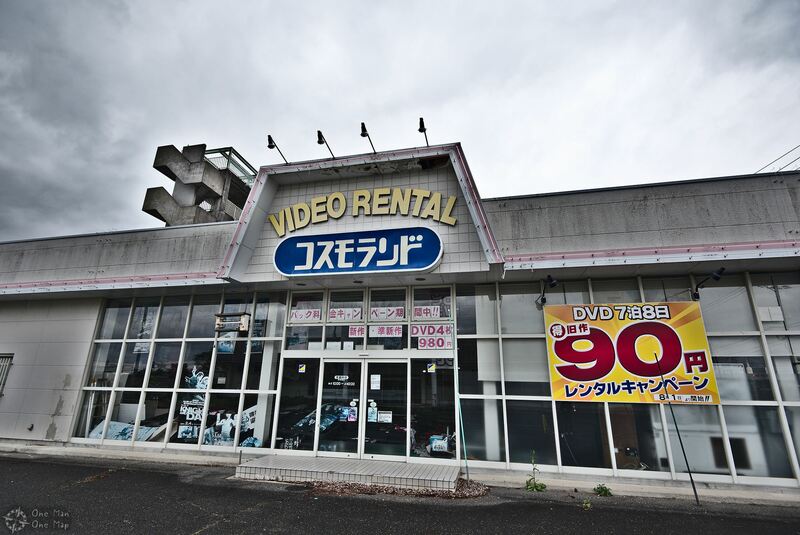 The video rental store opposite it most likely faces the same fate. 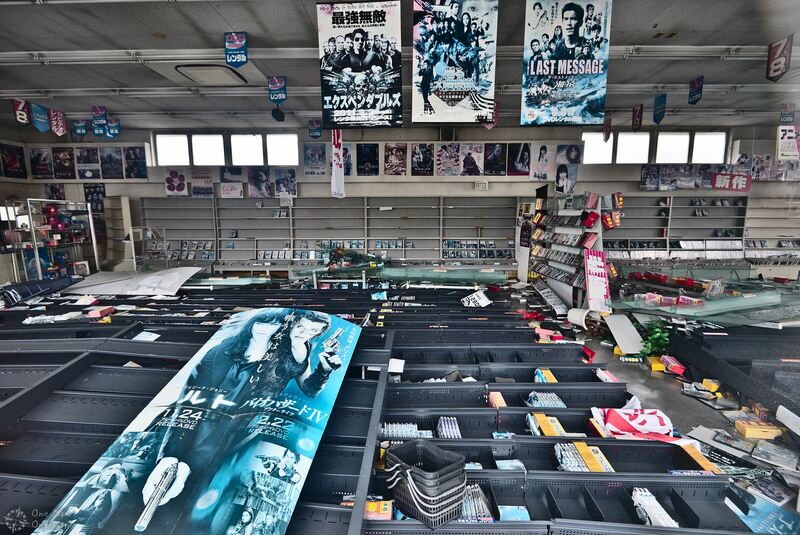 Action movies like Umizaru 3: The Last Message (海猿) seemed to have been in high demand back in 2011, at least the advertisement banners suggested so. While we were walking through Namie it began to rain heavily and the temperature dropped quite noticeably. I had to put protective bags around my cameras, we got wet and shivered, but I was unable to just go back to the warm and dry car. 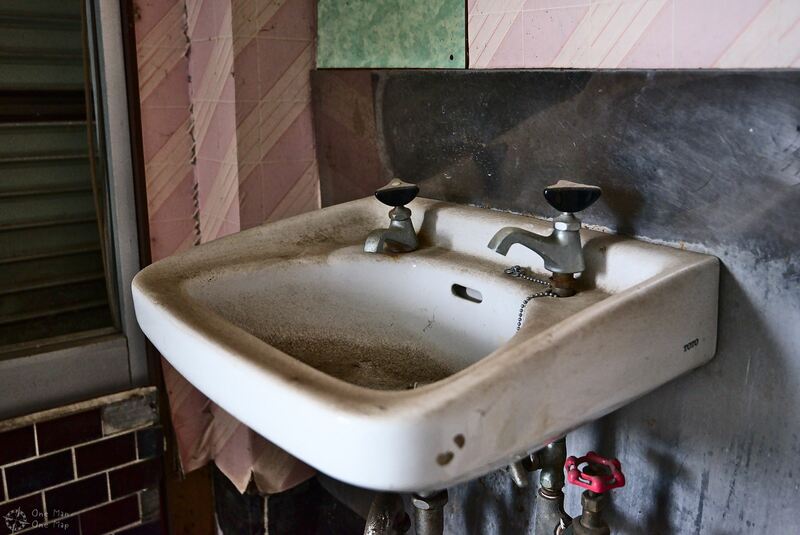 There were so many artifacts everywhere, so many damaged buildings, so many remains of what had once been the daily lives of several thousand people. 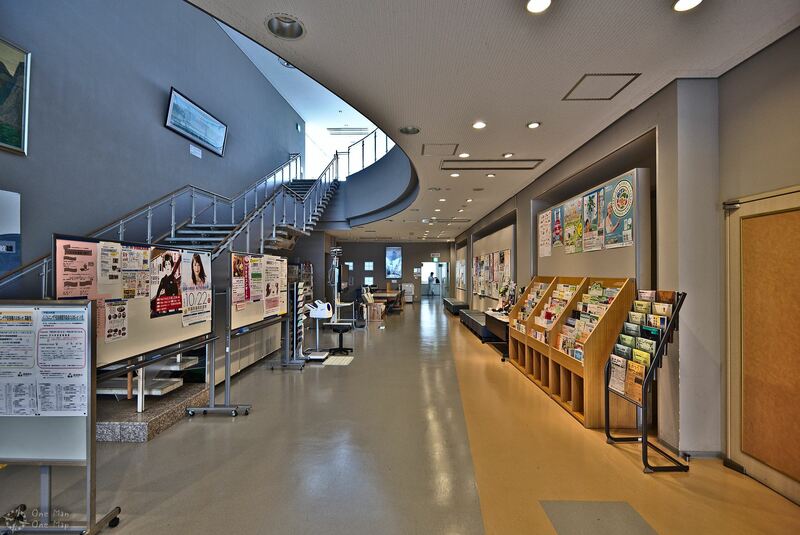 What you’re seeing in the next picture is not the ground floor, but the first floor. 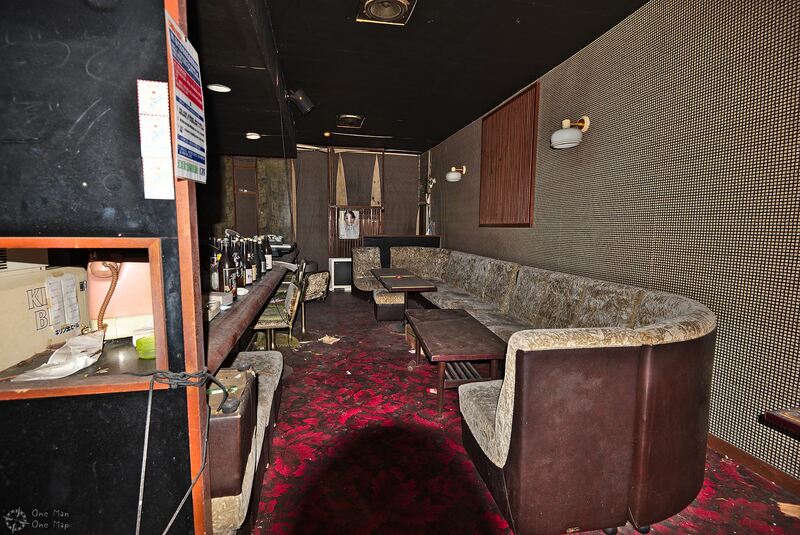 The walls of the ground floor tipped sideways, while the first floor with the Cocktail Bar fell down and stayed nearly intact. Even the bottles were still standing upright. Knowing that the demolition workers were not far away gave me an additional motivation boost. About one thousand home owners had already decided that they would not come back, abandoning their houses forever. Within months or at maximum one or two years most of this whole scenery would be gone, and there would be nothing left to remind people about the true impact of the catastrophe. These pictures here might be some of the few ones left then. Some stores on the main street still looked like nothing had ever happened. 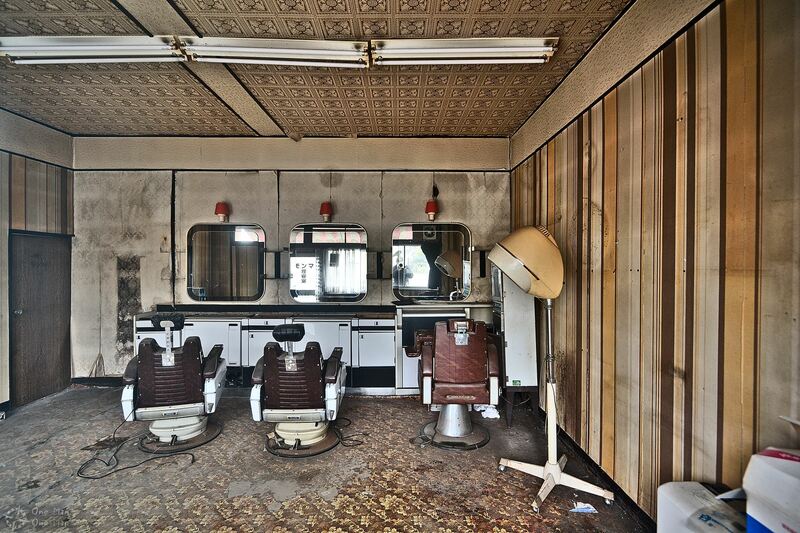 If I didn’t know the pictures of this hairdresser’s had been taken in an Evacuation Zone in the middle of other buildings damaged by an earthquake, I would probably assume it was just a normal, old, abandoned store. Imagine having to run for your life, evacuate to some far-away place, and then only be able to come back six years, to a living room in this condition. The building has to be torn down and rebuilt before you can live here again, all your belongings have to be replaced. But the whole neighborhood is deserted. Most of your family members, friends and acquaintances have left. All the shops you used to go to are closed, there’s no doctor’s office in the vicinity anymore, no hospital. But worst of all there is still radioactive material in the soil, and there’s still invisible radiation in the air. I guess I can very much understand those who decided to not come back right now, even if areas are declared safe again and the basic infrastructure is slowly being rebuilt. It will take years until things have settled and everything that reminds people of the tragedies has disappeared. It was a miracle some houses were even still standing and hadn’t yet collapsed under the elements. We decided to cross the Red Zone on Route 6 from North to South to see what it was like to be in an area where you’re not supposed to leave your car, slow down or turn around if it isn’t absolutely necessary. The part of this road inside the Red Zone is about 15 kilometers long. As you can see in the following visualization of our Geiger counter track, the radiation levels started to get much higher as soon as we went inside. For most of the time they were between 1 and 2 µSv/h, but you have to consider that the roads had been decontaminated and the falling rain was cleaning the air and the surfaces. The highest level of radiation we measured inside the car was around 4 µSv/h, two kilometers from the Nuclear Power Plant. 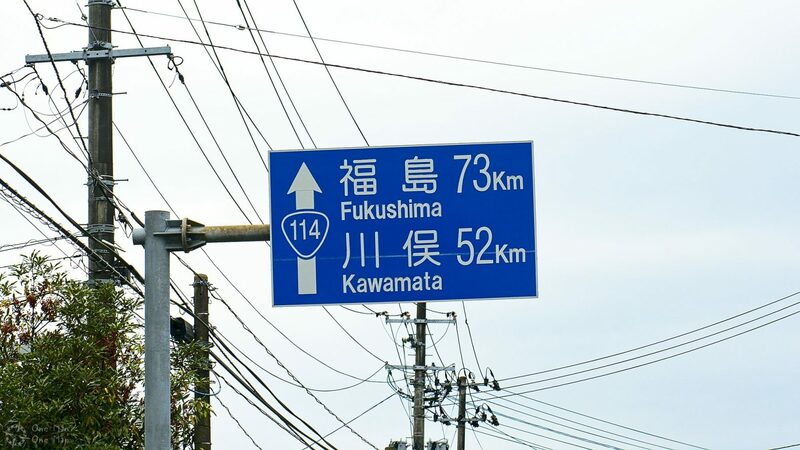 In October 2011 a SAFECAST team mapped Route 114, which crosses the Red Zone from West to East, and measured radiation levels of up to 20 µSv/h (enough to go through your yearly limit within 40 days). In September 2017, when Route 114 was reopened, the highest recorded level was a much lower 6 µSv/h. This is not surprising: Caesium-134 has a half-life of just two years, while Caesium-137 has a half-life of 30 years. After five years the remaining radiation caused by these two elements alone had decreased by about 60%. The bad news is that after 50 years there will still be enough radiation left to keep huge parts of the Red Zone uninhabitable. There used to be mobile check points with Geiger counters at the borders to the Red Zone, but those had been removed later. 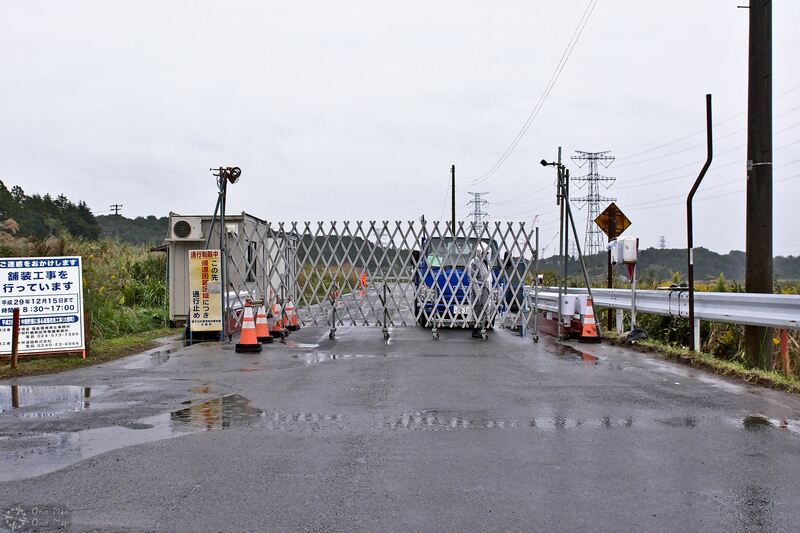 There was still an optional radiation screening area for cars, housed in a couple of containers, on a former parking space at the northern border to the Red Zone. We went through out of curiosity, since hardly anybody else used them anymore. I was not allowed to take pictures inside, and there wouldn’t have been much to see anyways. The workers no longer scanned the whole car with their portable Geiger counters, like in the previous years, but just the tires and fenders. At around half of the distance the road branches off to the main entrance of the Nuclear Power Station. The public is not allowed to go anywhere near it, so we were stopped by a guard at a gate around two kilometers from it. 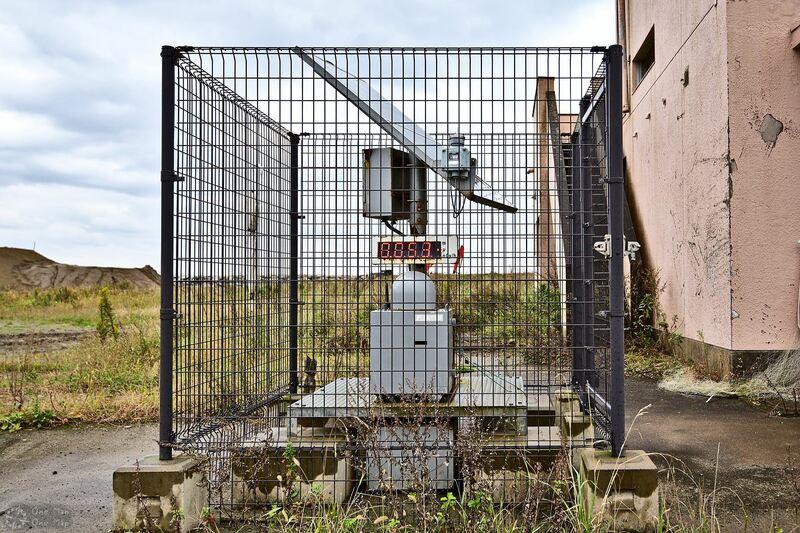 This is also the place where we got the highest reading on the Geiger Counter. 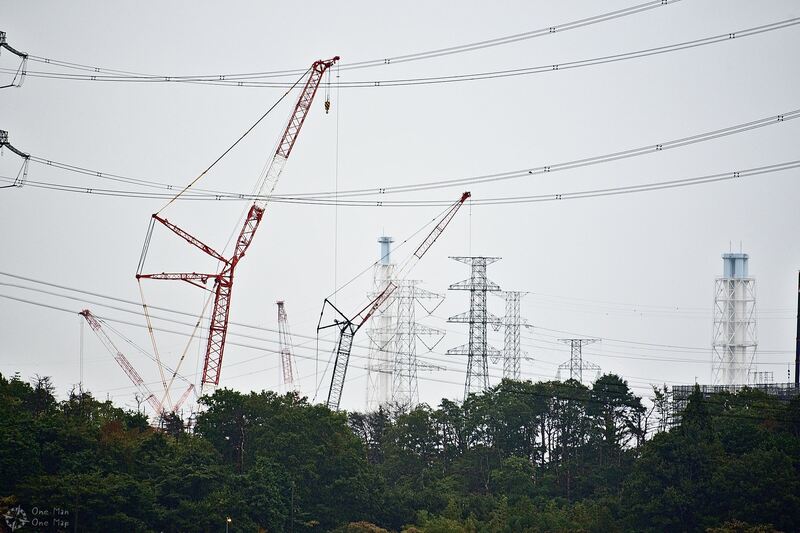 Using my tele lens I was able to take two pictures of the gigantic cranes over the damaged reactors. About 3,000 workers are currently working to stabilize, isolate and decommission the plant. One of their most important efforts, protecting the ground water and the sea from contaminated water using an artificial “ice barrier”, has proven to be unsuccessful, though. 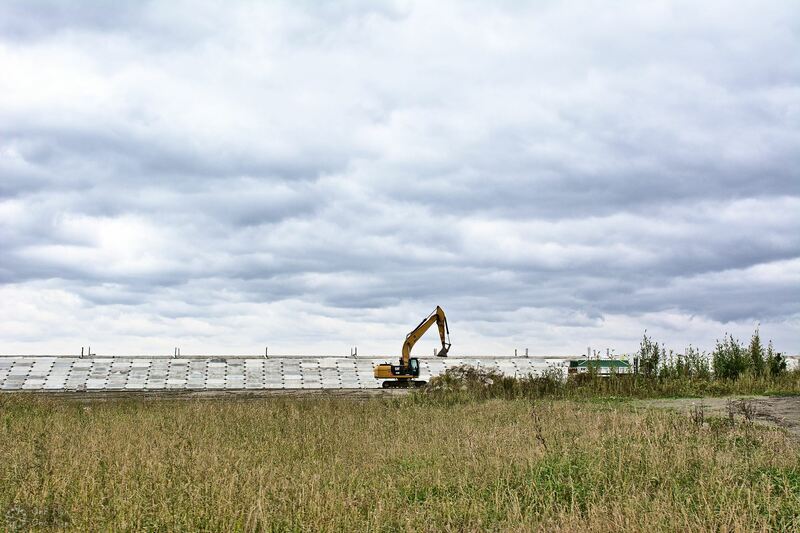 Contaminated water still escapes the barrier and has to be stored in over 1,000 tanks. Caesium can be removed from these tanks, but for some radioactive elements like Tritium there is no filtration technology at industrial scales. At some point the contaminated water will most likely have to be discarded into the ocean – something everybody wanted to avoid. Seven years after the disaster the situation for the workers has allegedly improved noticeably. It used to be impossible to walk around in the open without protection suits, but apparently most radioactive hot-spots have been removed or poured over with concrete by now. Most of the complex is said to be accessible with normal workers overalls again, melted fuel rods have been retrieved and stored in a new building. It is currently believed that it might now actually be possible to retrieve and decommission the reactors within the next 40 years. We continued southwards, always checking our Geiger counter and comparing the readings to the official monitoring stations. 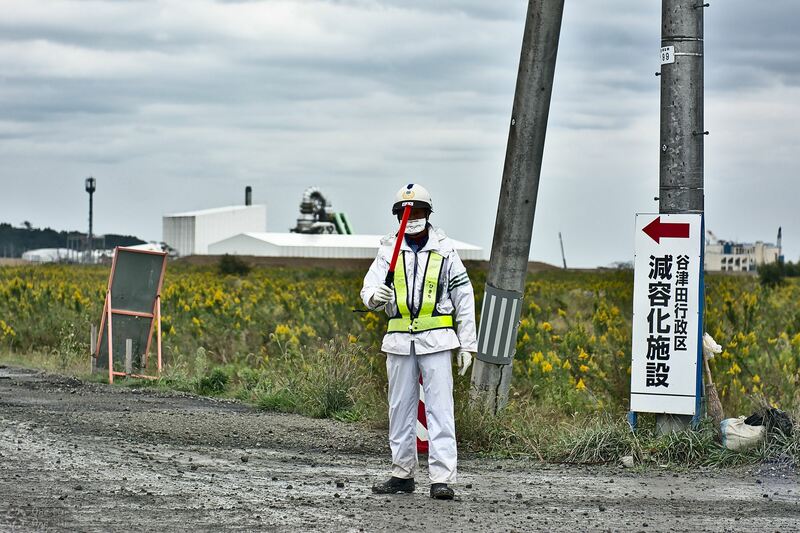 Even on the decontaminated road the radiation levels could still reach up to 3 µSv/h, about as much as being on an airplane non-stop. 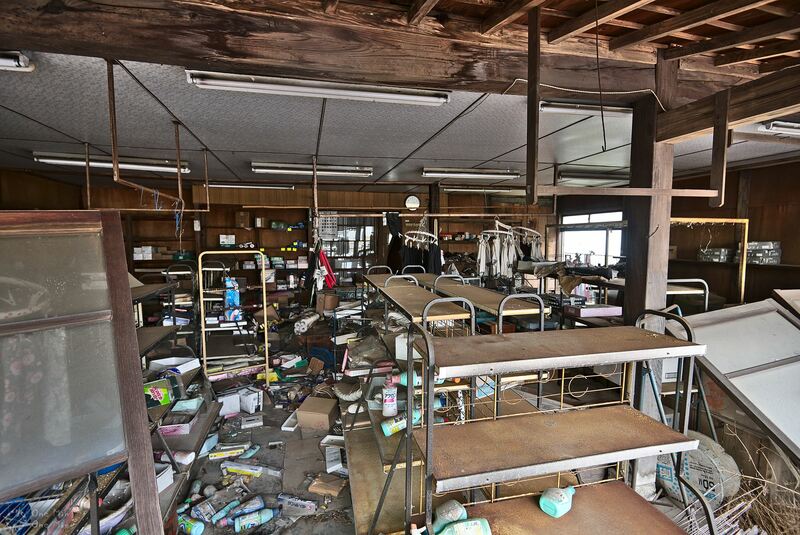 Namie had felt like a Ghost Town, but the Red Zone was like a giant Ghost Zone. 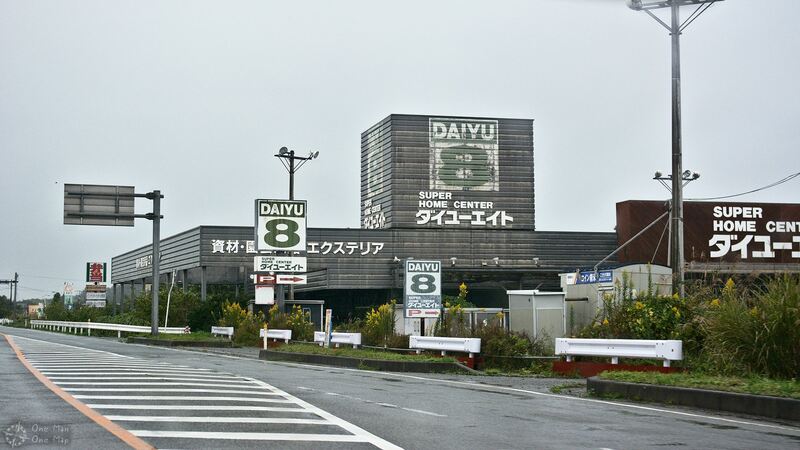 Route 6 touches Futaba and goes through Ōkuma, two towns with a former combined population of about 17,500 people. So there was everything from houses, big super markets, hardware stores, gas stations, manufacturing plants and car dealerships to gambling hells. All roads and paths branching off of Route 6 had been blocked with fences and barriers, and sometimes even using contaminated objects and vehicles. The only two places still open inside the Red Zone were these two gas stations. Drivers need to be able to refill their cars or get assistance in case of a road emergency, and the workers need fuel for their vehicles too. Since there was still enough time left we decided to turn around, drive back to Namie, and then go South a second time. Thus we crossed the Red Zone three times in total. Only very few people were walking around in the open, most of them apparently workers and officials. I don’t think this would be something I would have the courage to do for a living. At some points we could see the interrupted Jōban train line. 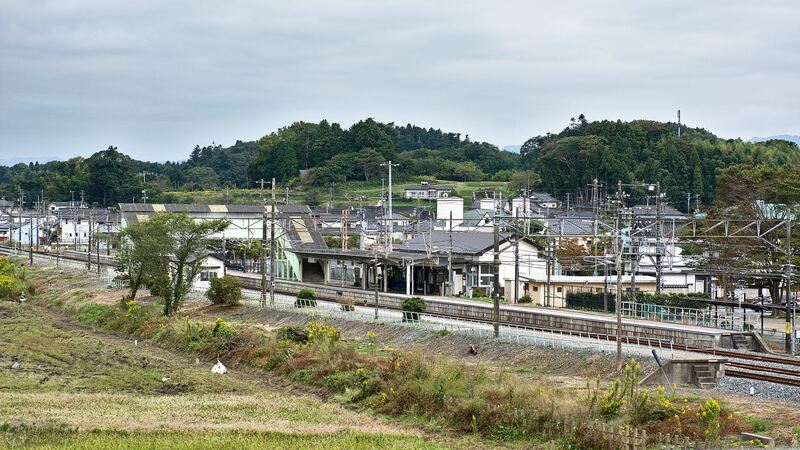 Japan Railways have been trying to reconnect it for several years, but the radiation levels are still so high that the reconstruction of the tracks has proven to be much more complicated than previously thought. Full reconstruction is now expected to be completed by 2020. At the end of our tour Karin drove me to Tomioka station, from where I went on to Nikkō. 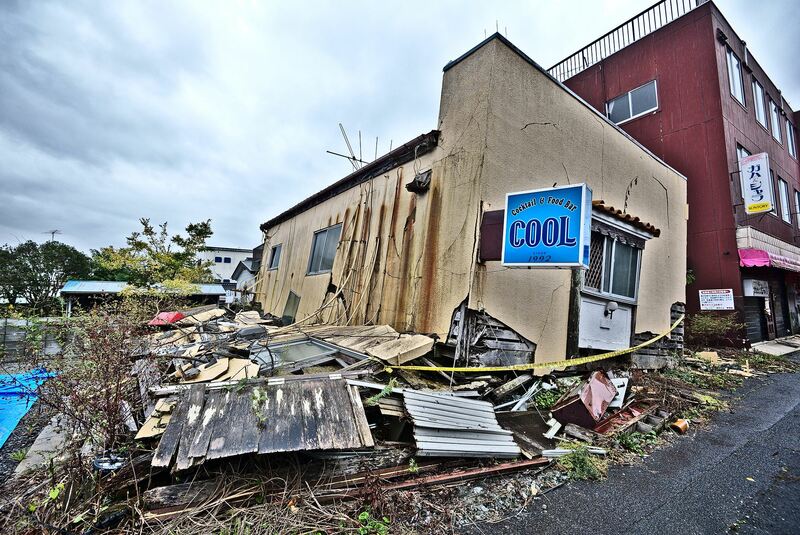 I’ve learned two important lessons during my visit to the Fukushima Evacuation Zone. Despite numerous accidents at nuclear facilities (at least 20 meltdowns since the 1950s) and the existence of two large Nuclear Disaster Evacuation Zones (Chernobyl and Fukushima), at least 450 Nuclear Power Stations continue to be in operation around the world. Yet they provide much less than 10% of the world’s electric power. 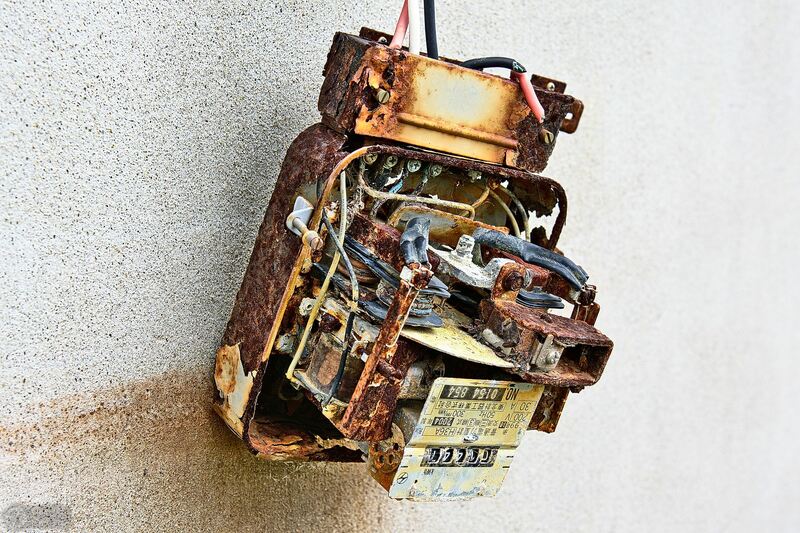 Everybody who lives in the vicinity of a Nuclear Power Plant, every engineer, and especially those who advocate for the continued use of Nuclear Power, should come to Fukushima and see for themselves what happens when technology fails. 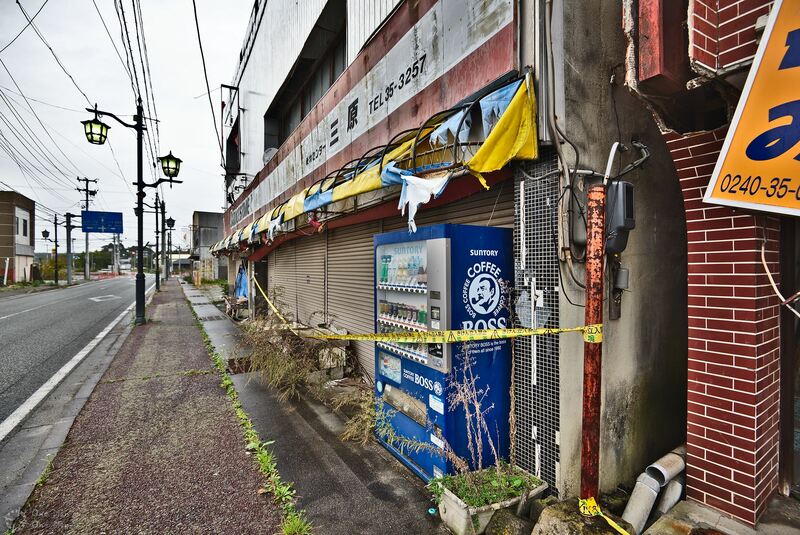 Fukushima could truly happen everywhere. Let’s learn our lessons from the tragedy its residents had to go through. 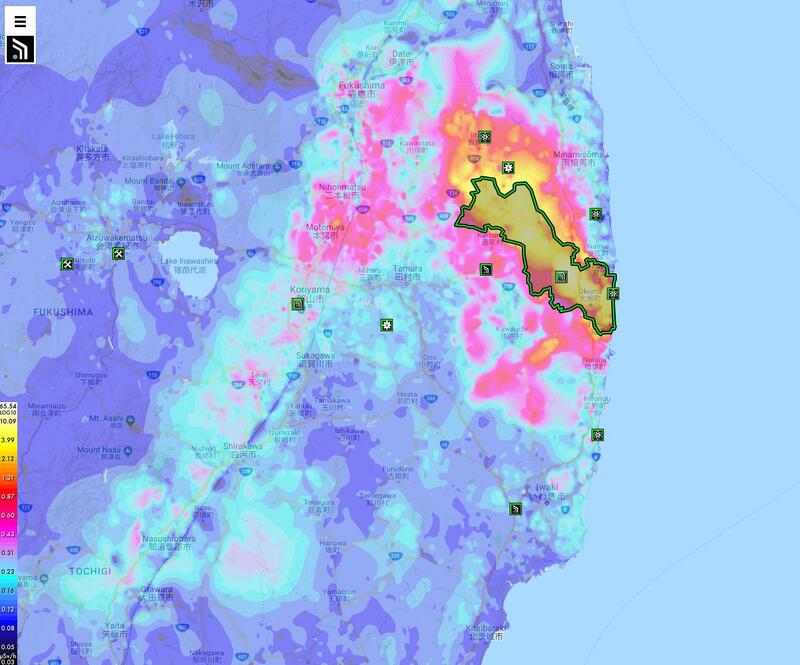 Secondly, It might look like there is not much hope for the Evacuation Zone, but that’s absolutely not true. I admit the pictures I took look horribly depressing, but that’s because they were taken at the worst point in time imaginable. They are supposed to be depressing, they’re are a warning to the rest of the world. 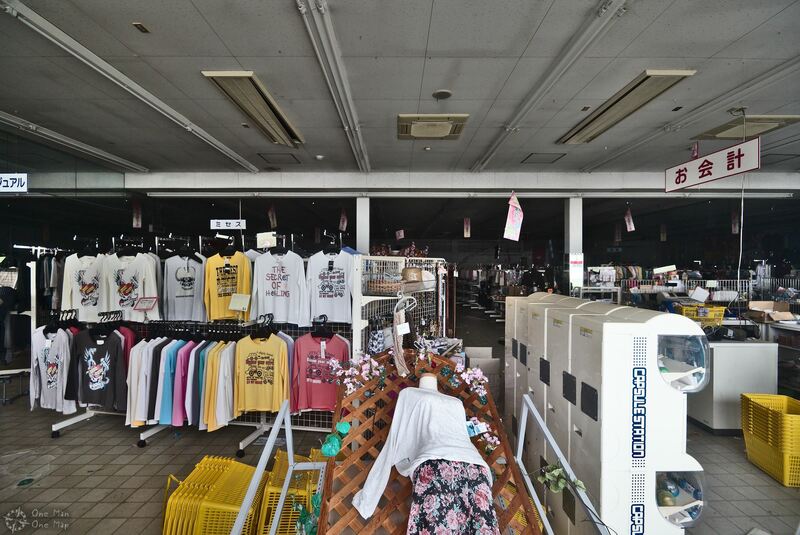 Reality in the Fukushima Evacuation Zone will never look as bleak as in these pictures again, though. Radiation levels are already low enough in most places and will only drop further, the ruins and the debris will disappear, more areas will be declared Orange or even Green Zones over time. 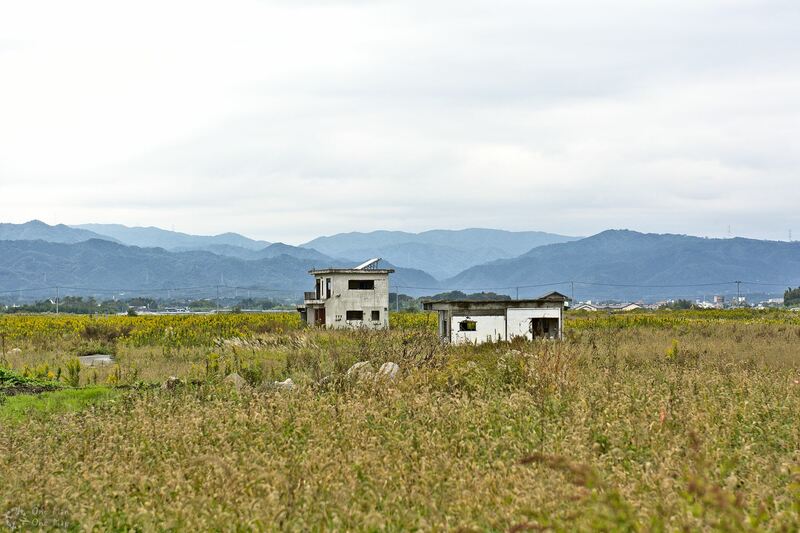 Six years after the disaster the Evacuation Zone has already shrunk to about 30% of its original size, now making up less than one percent of the whole Fukushima prefecture. 80 percent of the former residents have not come back yet, but that also means 20 percent have already done so. New residents will settle, tourism will come back, the economy will pick up again. Normality will come back. I would like to thank Karin Taira for organizing my trip, her excellent translation skills and all the help with this article, Anbe Katsumi for agreeing to the interview, and the NOMADO project for forwarding my request to Karin.